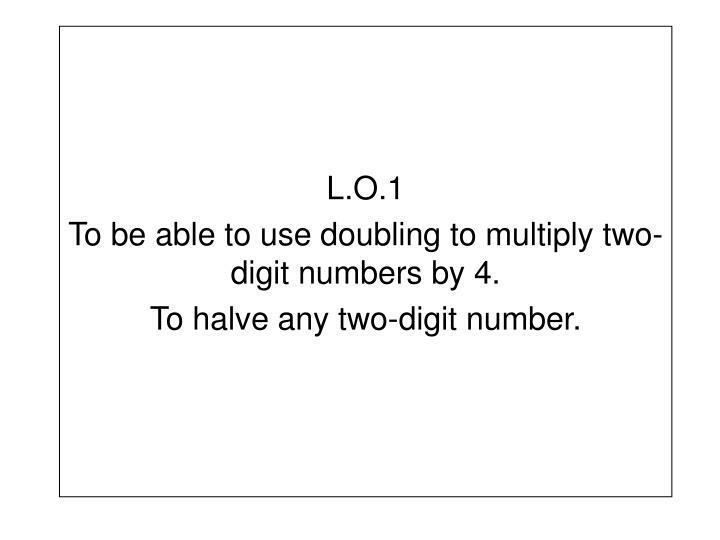 To be able to use doubling to multiply two-digit numbers by 4. To halve any two-digit number. 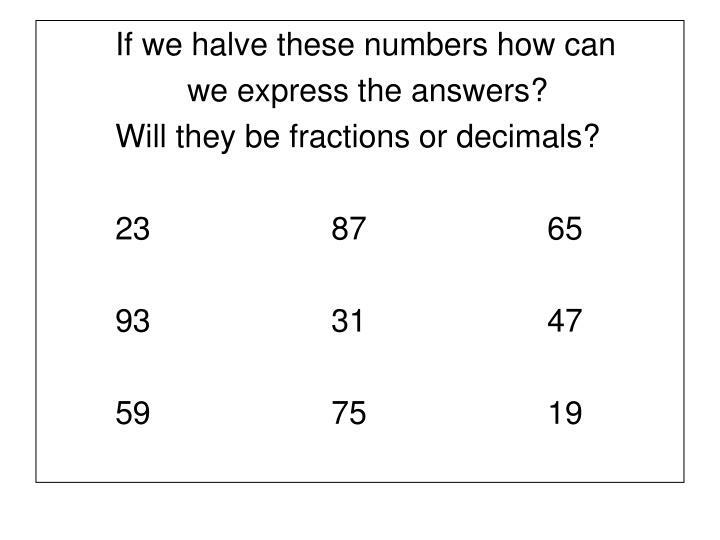 Will they be fractions or decimals? Q. 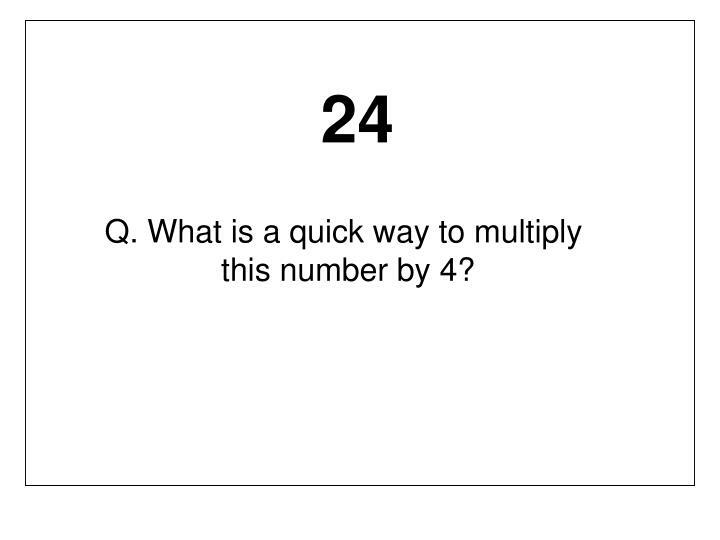 What is a quick way to multiply this number by 4? 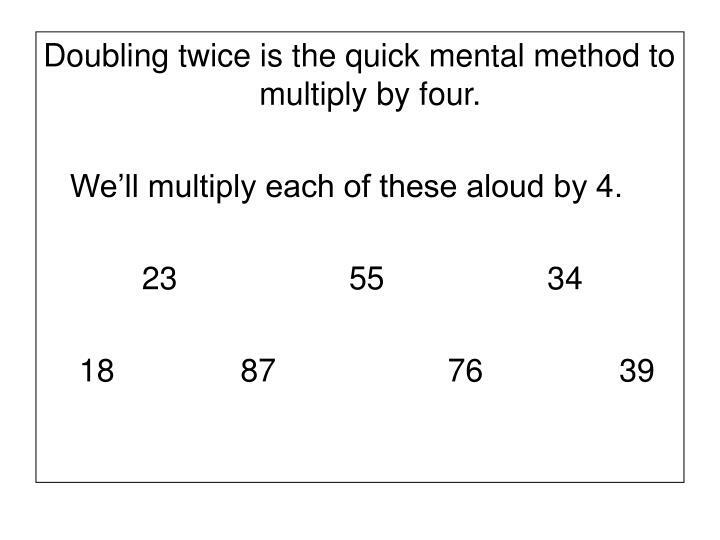 Doubling twice is the quick mental method to multiply by four. 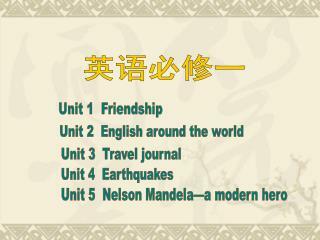 We’ll multiply each of these aloud by 4. 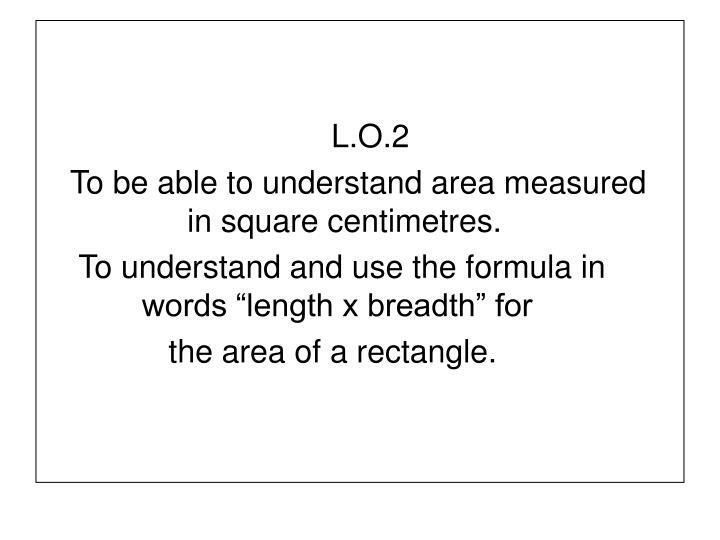 To be able to understand area measured in square centimetres. 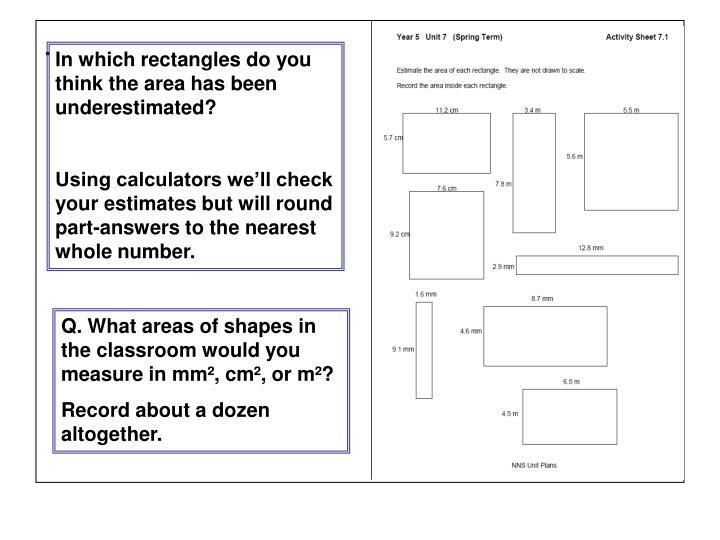 We used cm² to find the areas of shapes in yesterday’s lesson. Here we have a square metre. 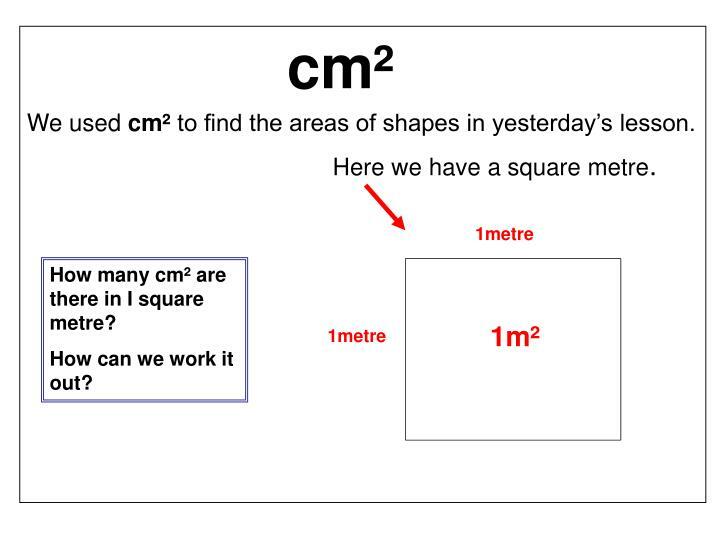 How many cm² are there in I square metre? Q. 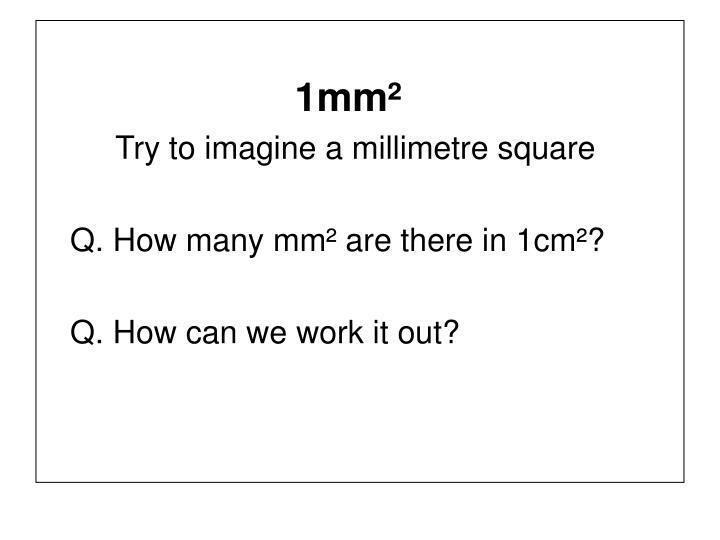 How many mm² are there in 1cm²? Q. How can we work it out? 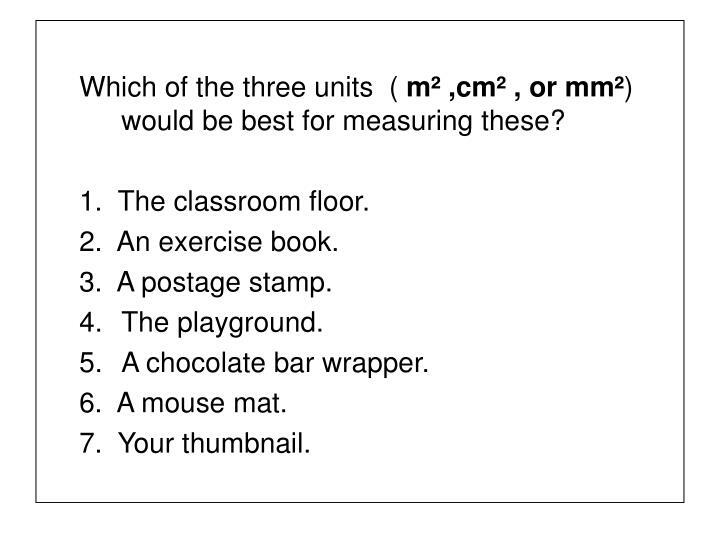 Which of the three units ( m² ,cm² , or mm²) would be best for measuring these? 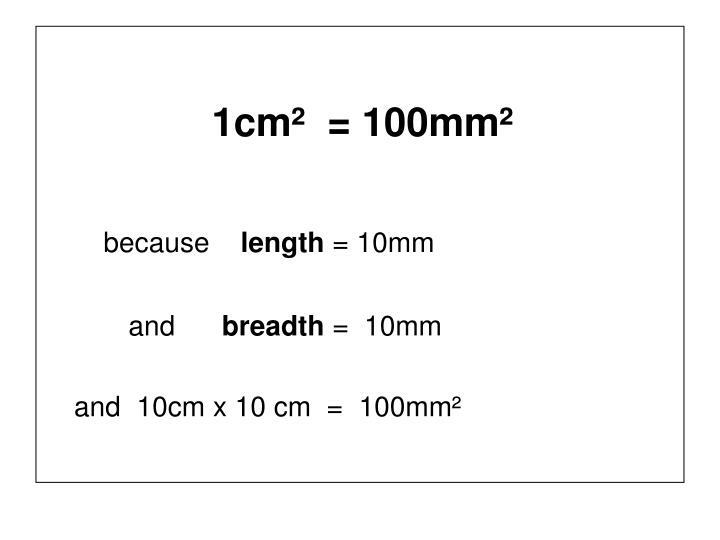 The area of a rectangle is length x breadth or l x b for short. Q. 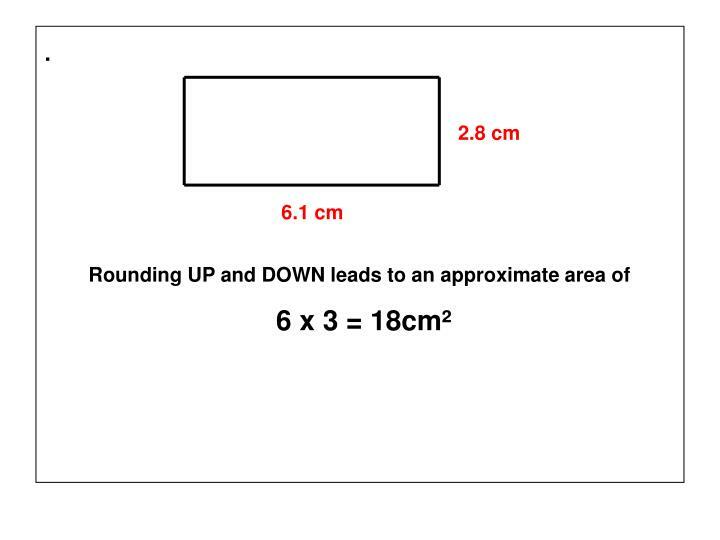 What is the approximate area of the rectangle? 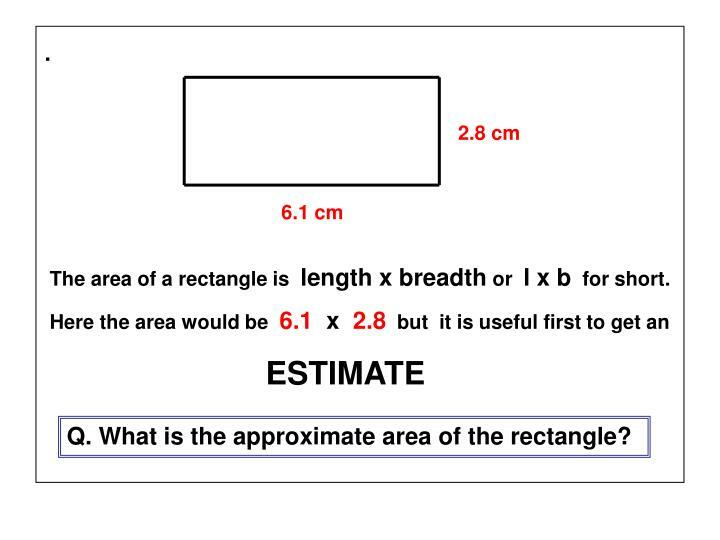 In which rectangles do you think the area has been underestimated? 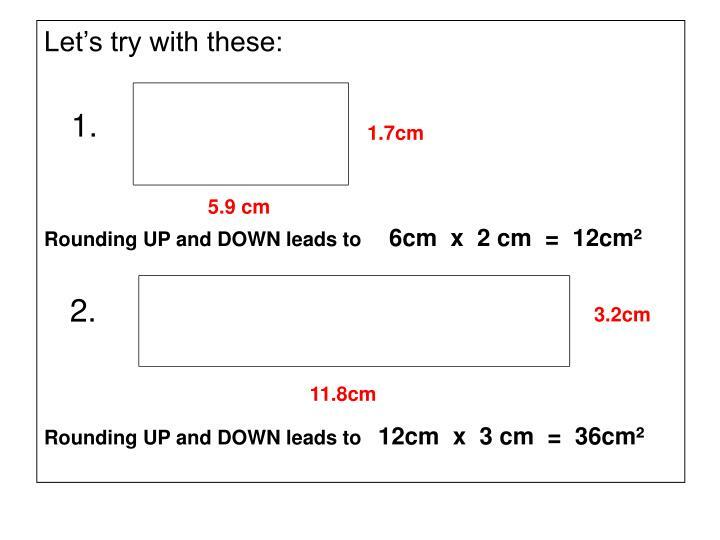 Using calculators we’ll check your estimates but will round part-answers to the nearest whole number. Q. 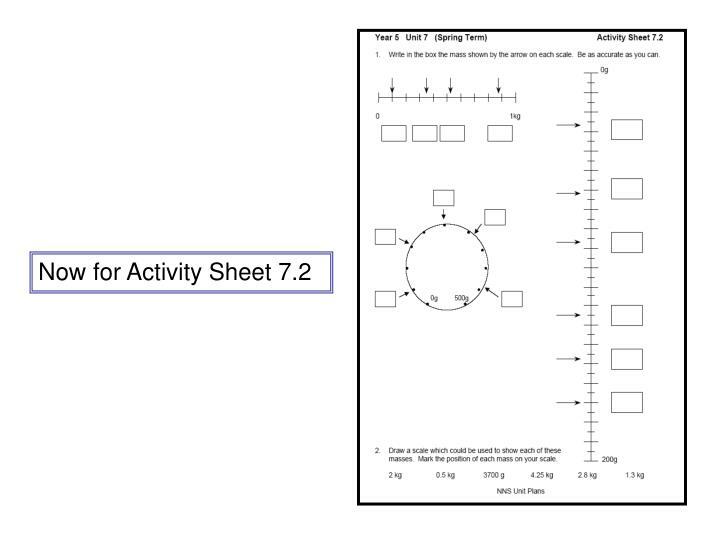 What areas of shapes in the classroom would you measure in mm², cm², or m²? Record about a dozen altogether. 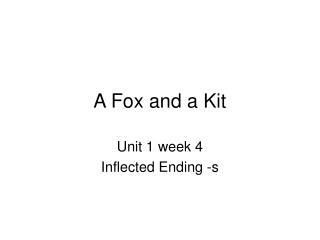 In your book draw rectangles using cm and mm and write their length and breadth. Be accurate! 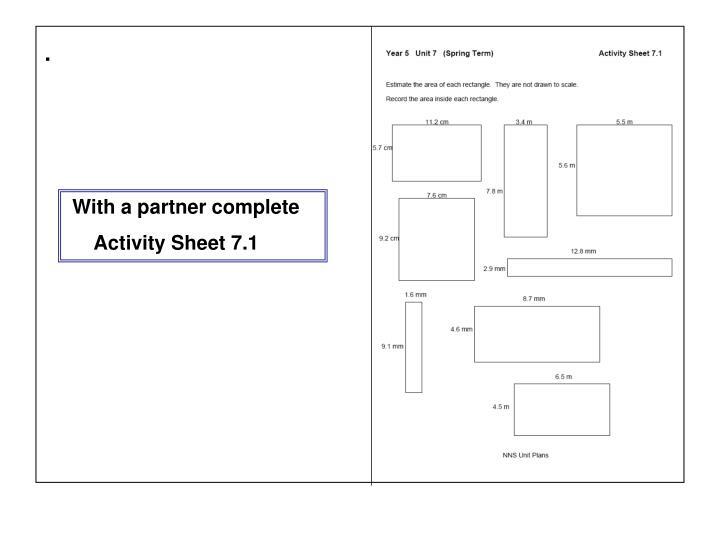 Your partner must first estimate the area by rounding up or down then work out the area to the nearest whole number using a calculator. 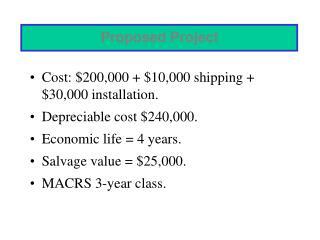 Record both the estimate and the final answer. 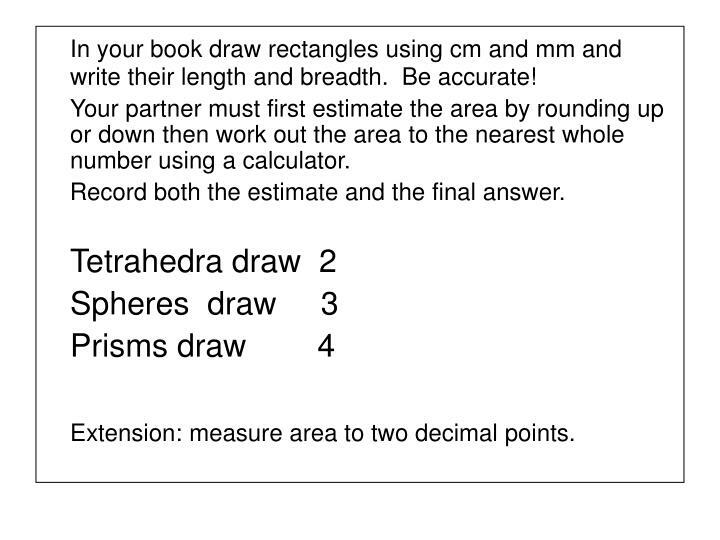 Extension: measure area to two decimal points. 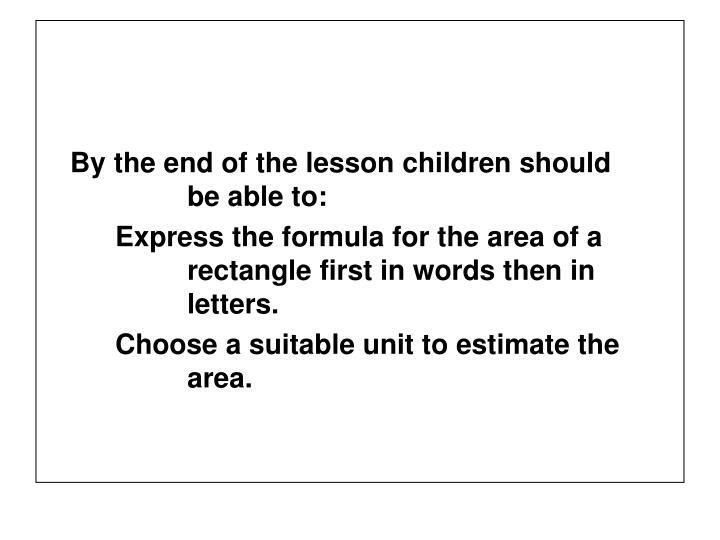 Express the formula for the area of a rectangle first in words then in letters. 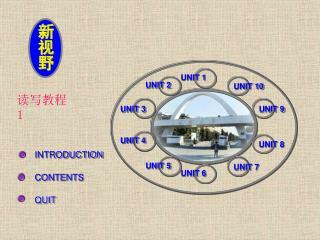 Choose a suitable unit to estimate the area. number with up to two decimal places. 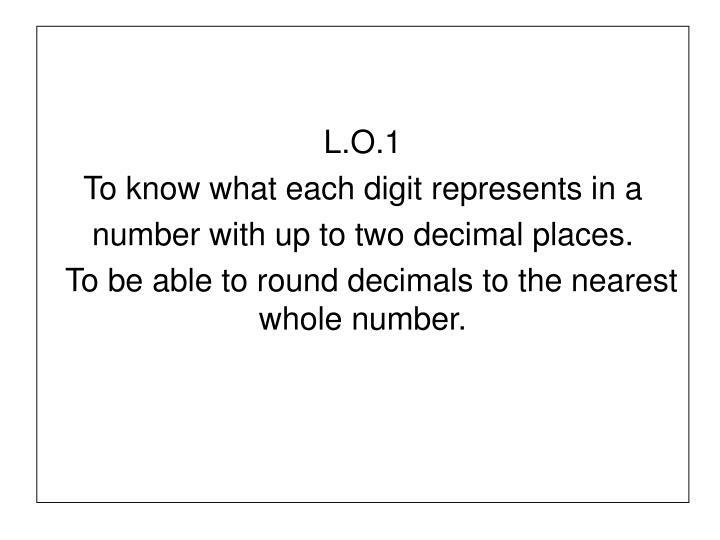 To be able to round decimals to the nearest whole number. 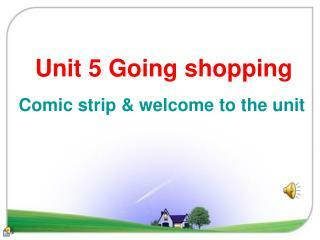 This is our number line. 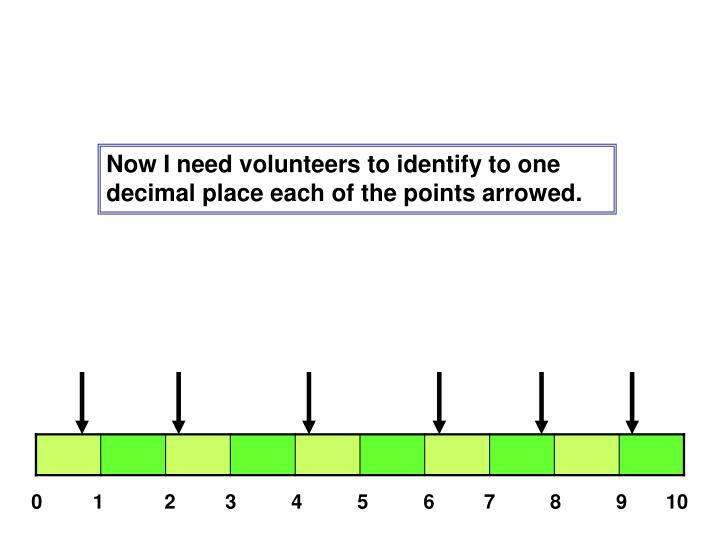 Now I need volunteers to identify to one decimal place each of the points arrowed. 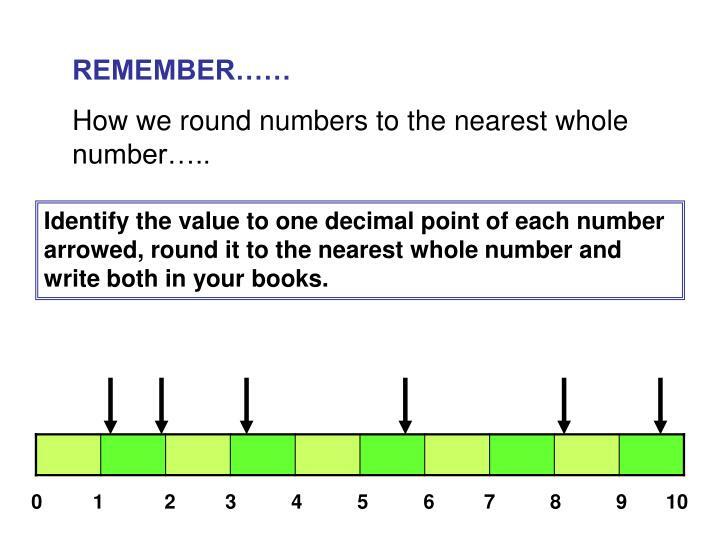 How we round numbers to the nearest whole number…..
Identify the value to one decimal point of each number arrowed, round it to the nearest whole number and write both in your books. Q. 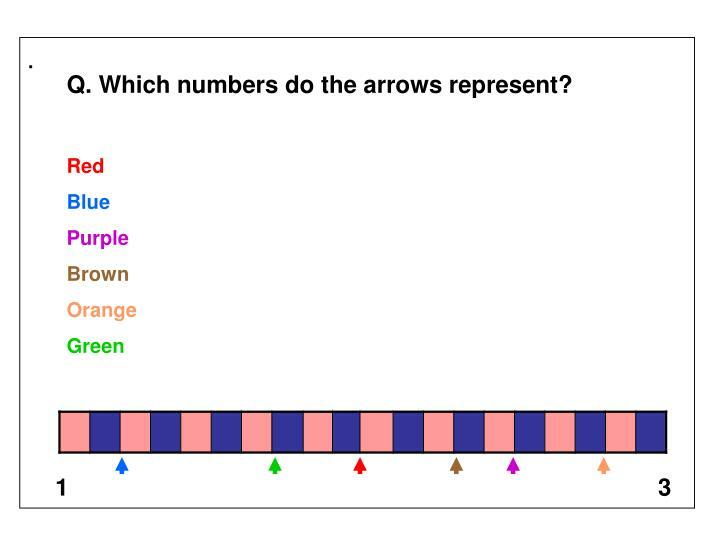 Which numbers do the arrows represent? Q. Where would these points fit on the line? Round these to the nearest whole number. 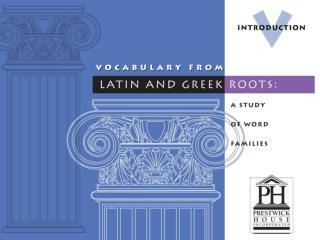 Write answers in your book. 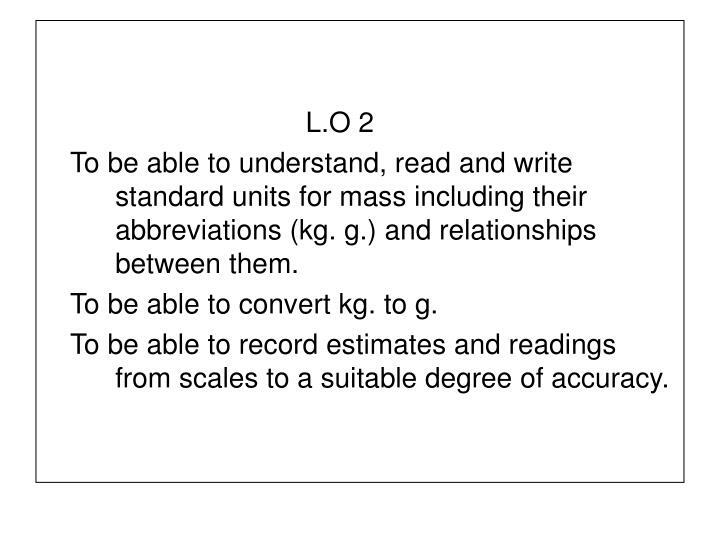 To be able to understand, read and write standard units for mass including their abbreviations (kg. 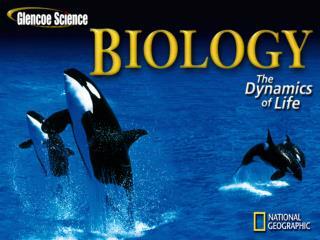 g.) and relationships between them. 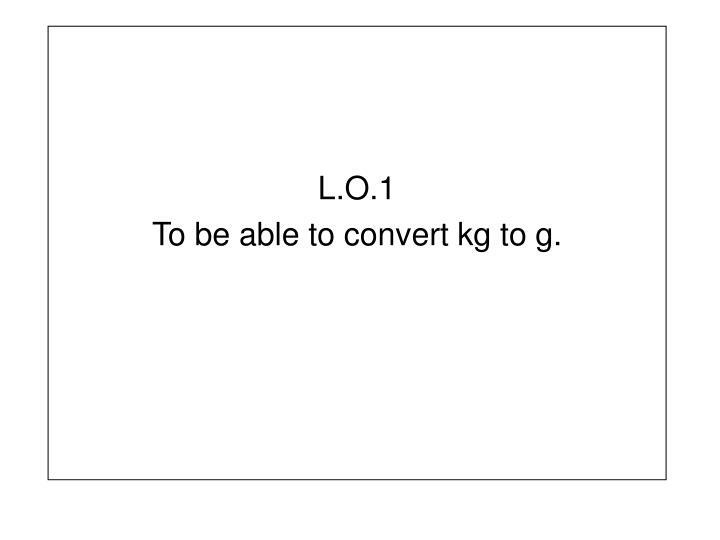 To be able to convert kg. 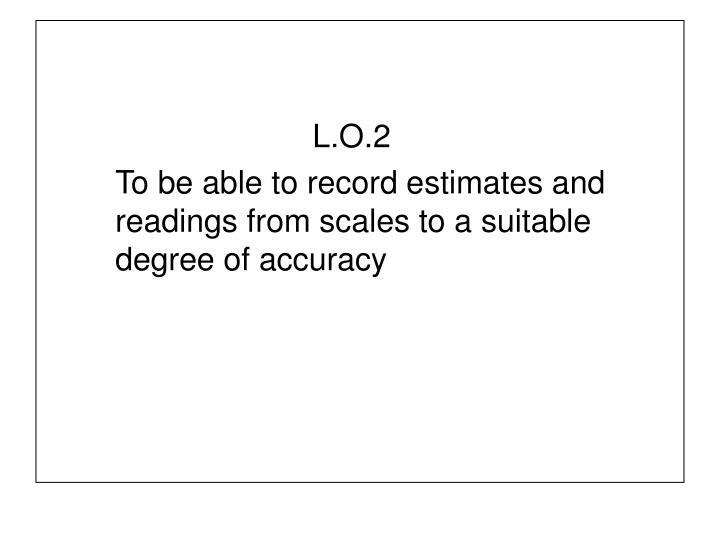 to g.
To be able to record estimates and readings from scales to a suitable degree of accuracy. 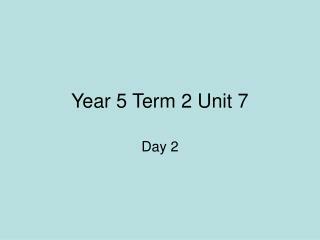 We are investigating MASS not weight since the mass of an object does not vary but its weight will change depending on where it is weighed. 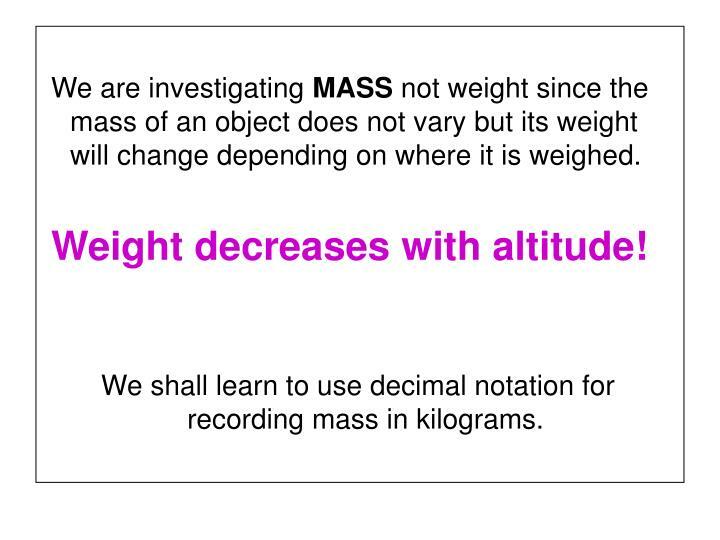 We shall learn to use decimal notation for recording mass in kilograms. 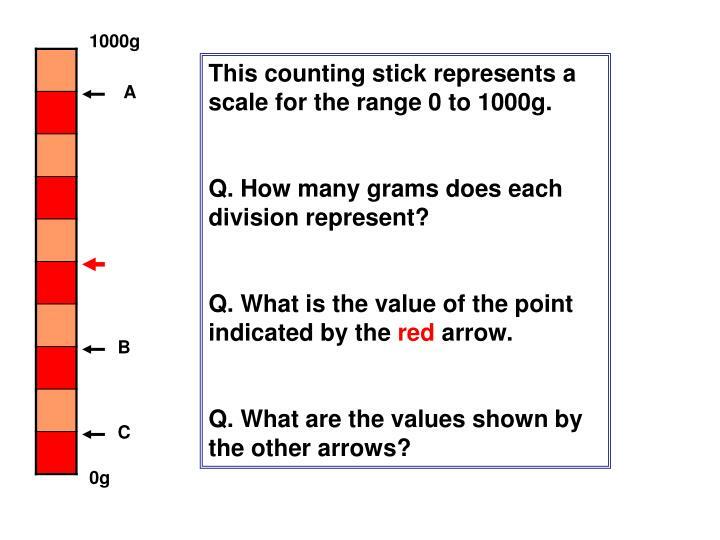 This counting stick represents a scale for the range 0 to 1000g. Q. 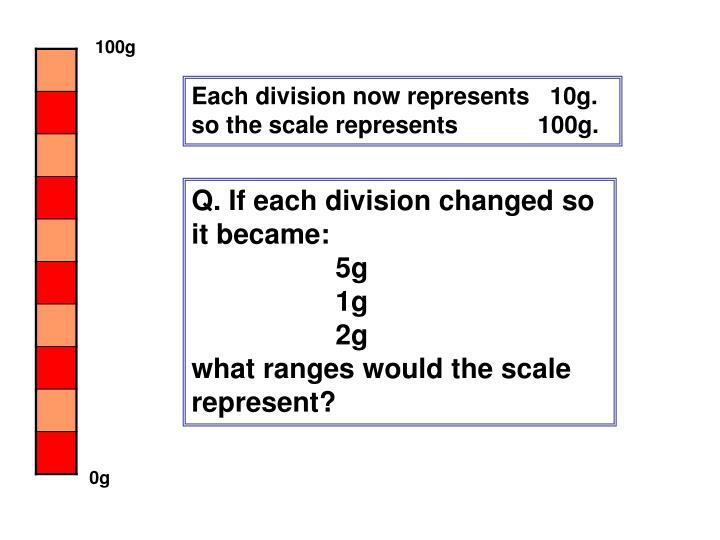 How many grams does each division represent? Q. What is the value of the point indicated by the red arrow. Q. What are the values shown by the other arrows? Q. What value does the red arrow indicate here? Q. What values do the other arrows show? Q. 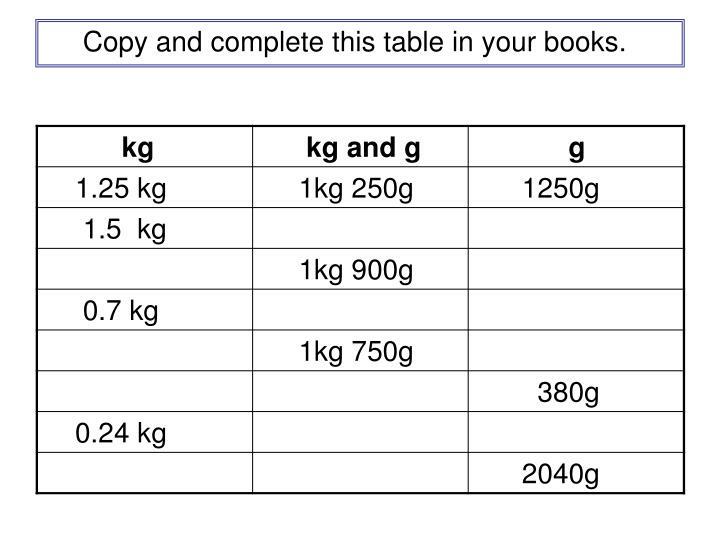 How many kg are equivalent to 1000g. Q. 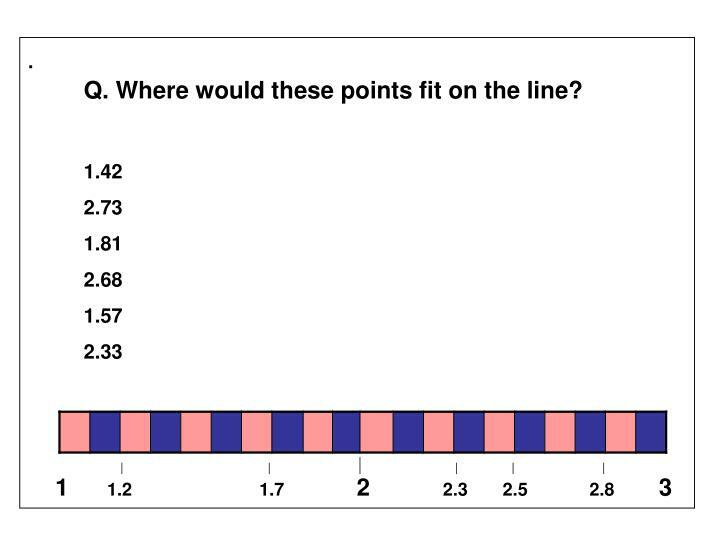 What fraction of 1kg does each division represent. or	0.1 of 1 kg. This counting stick now represents a scale for the range 0 to 2000g. Each division now represents 10g. so the scale represents 100g. 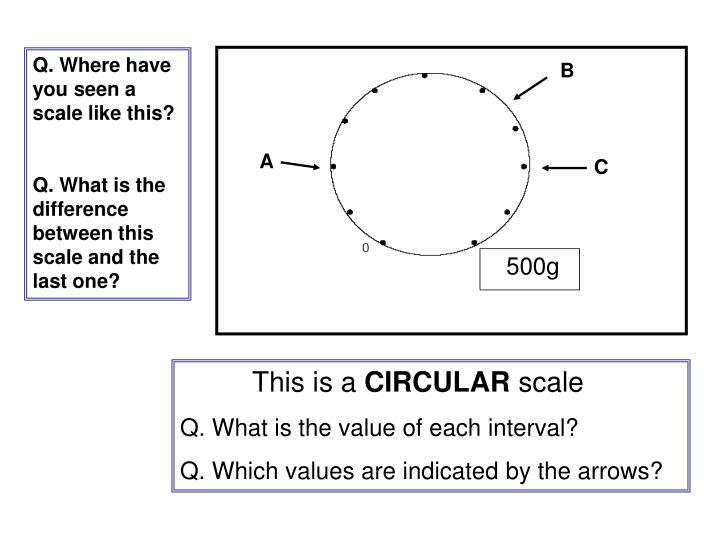 what ranges would the scale represent? How can we write this in kg and g; then in g? 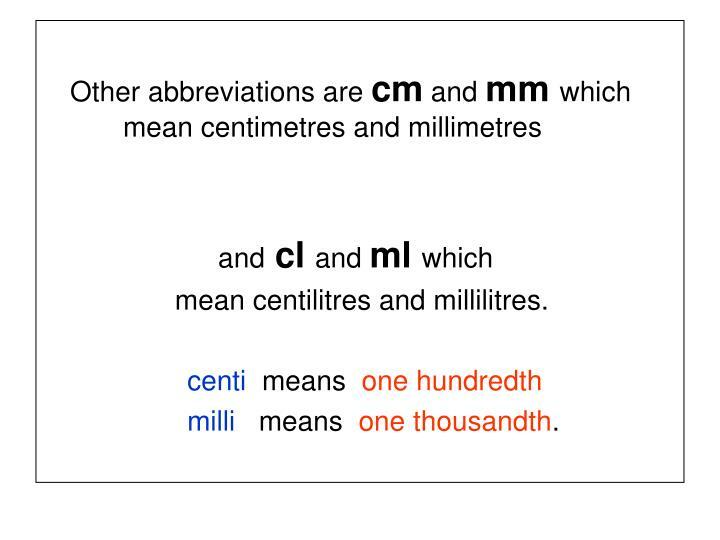 The first decimal place represents tenths of a kilogram and the second hundredths. 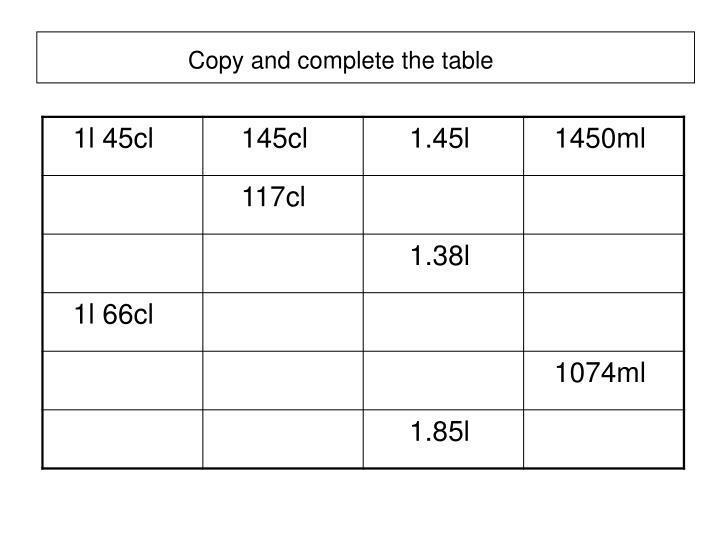 Copy and complete this table in your books. Q. 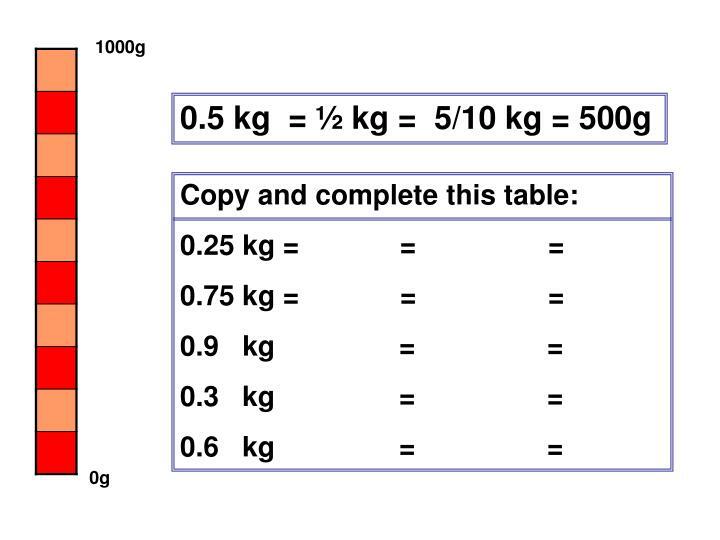 How do we convert kilograms into grams? Q. 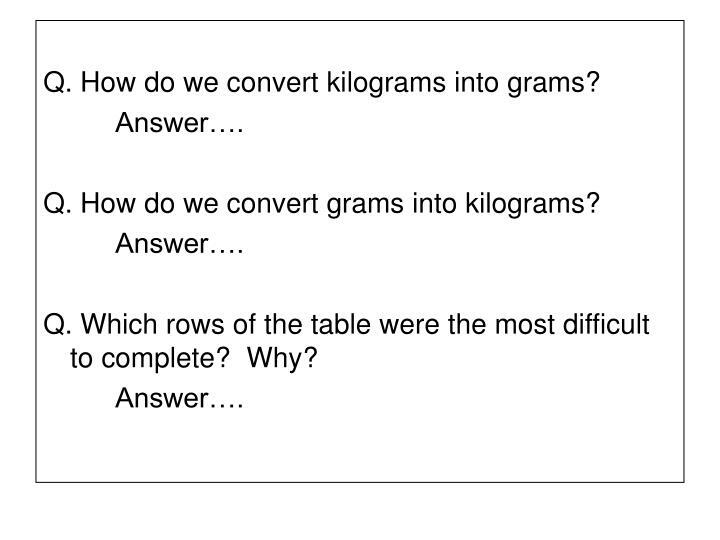 How do we convert grams into kilograms? Q. 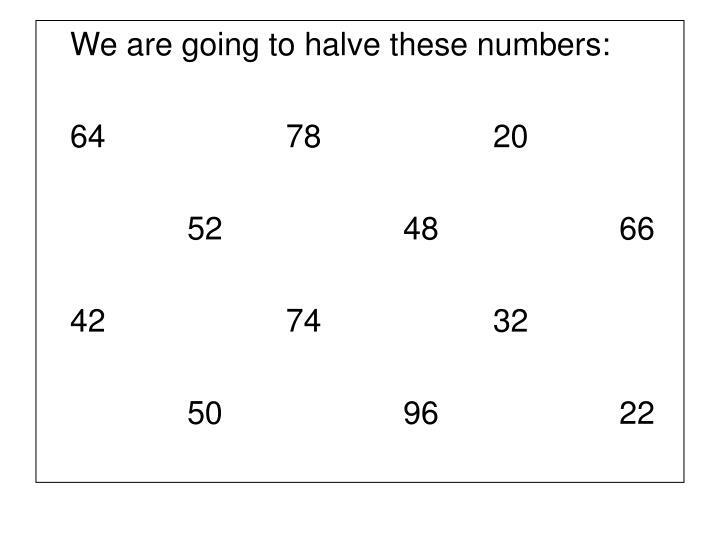 Which rows of the table were the most difficult to complete? Why? 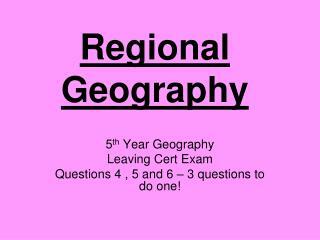 Use correctly the abbreviations g and kg. 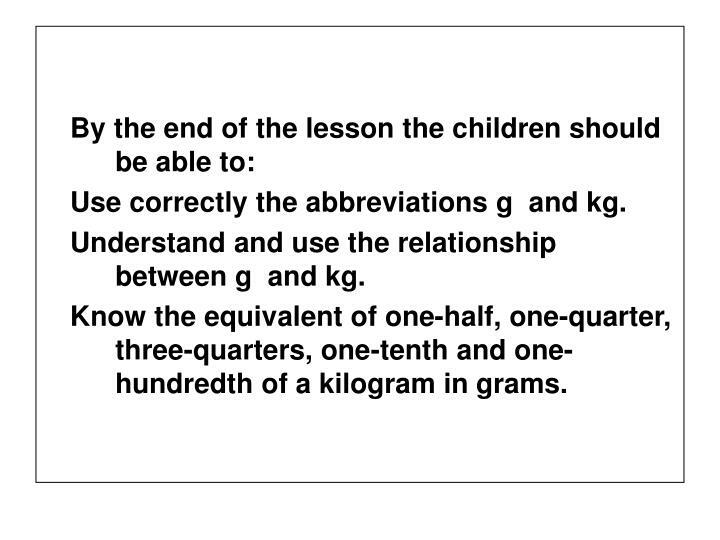 Understand and use the relationship between g and kg. 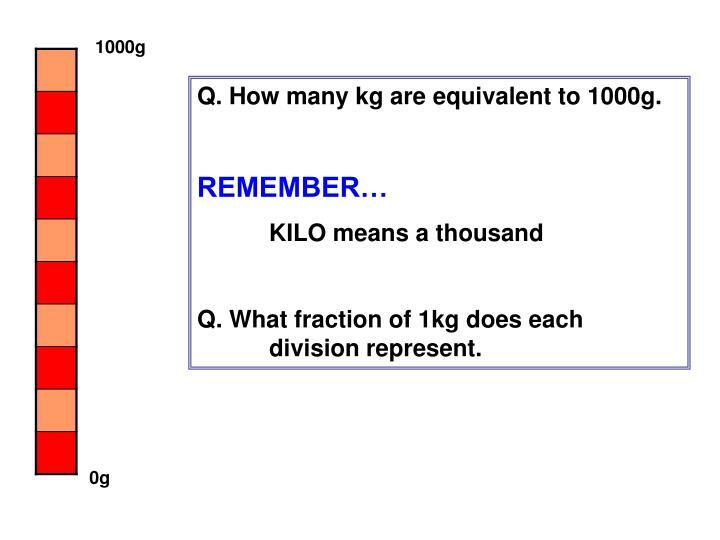 Know the equivalent of one-half, one-quarter, three-quarters, one-tenth and one-	hundredth of a kilogram in grams. 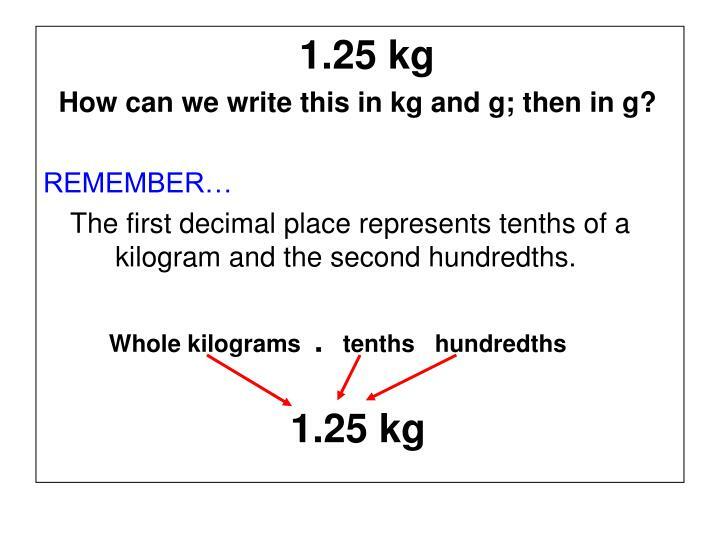 To be able to convert kg to g.
Q. 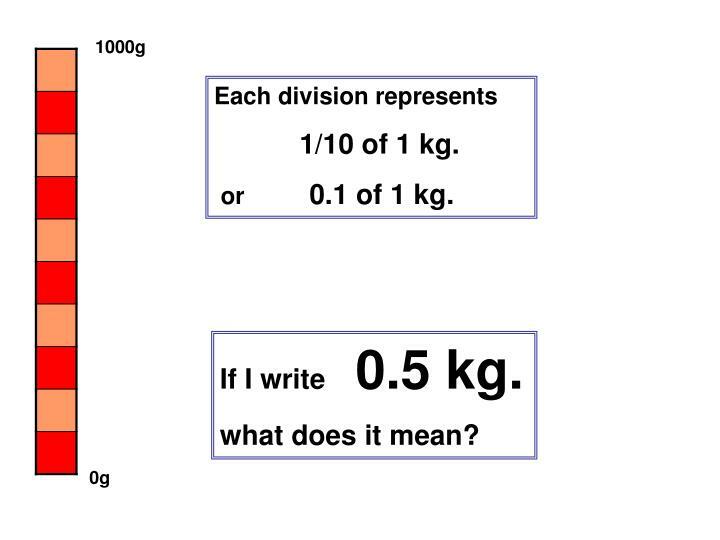 How many grams in 1 kg? 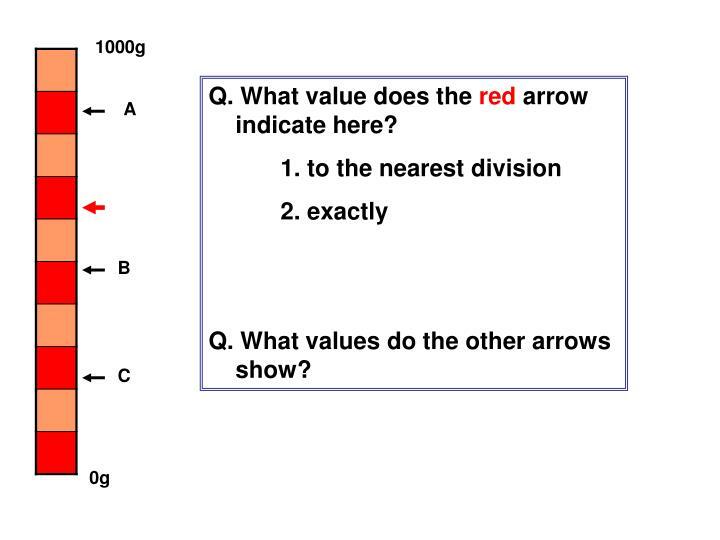 What mass does the red arrow represent? Q. 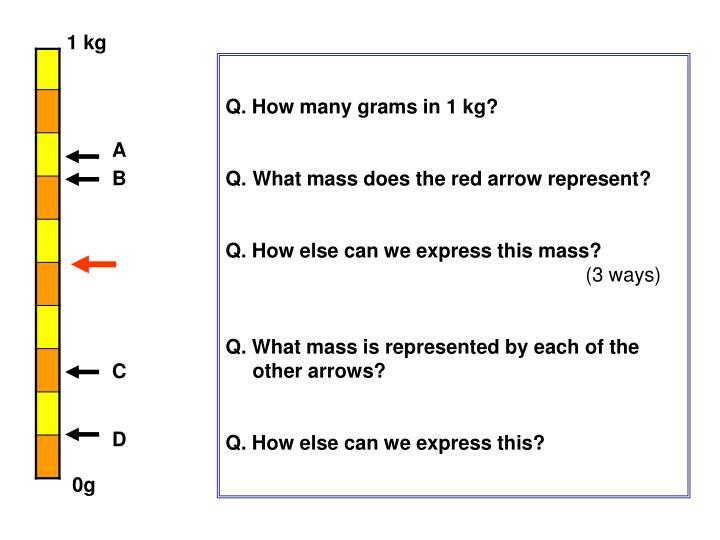 What mass is represented by each of the other arrows? Q. How else can we express this? What mass does each of the black arrows represent? Q. How else can we express this mass? Q. 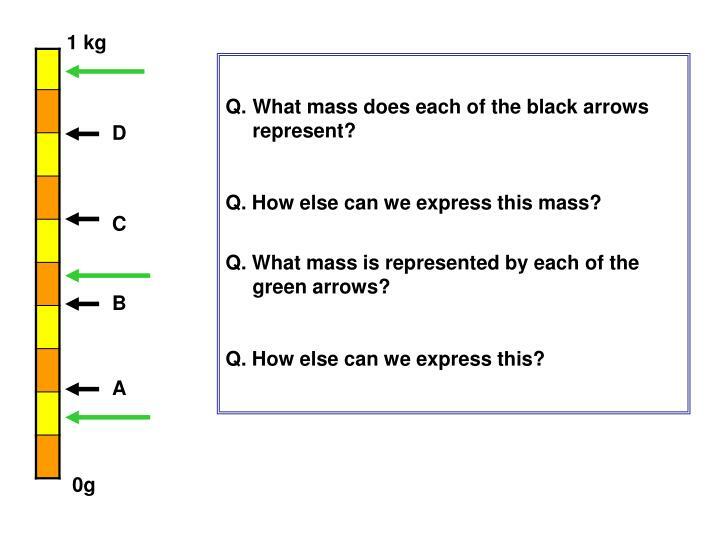 What mass is represented by each of the green arrows? Q. 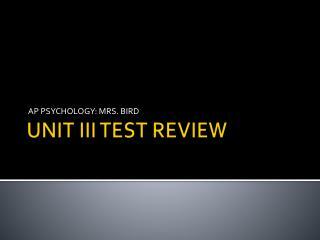 What is the value of each interval? Q. What value does each of the arrows indicate? Q. Now what is the value of each interval? Q. 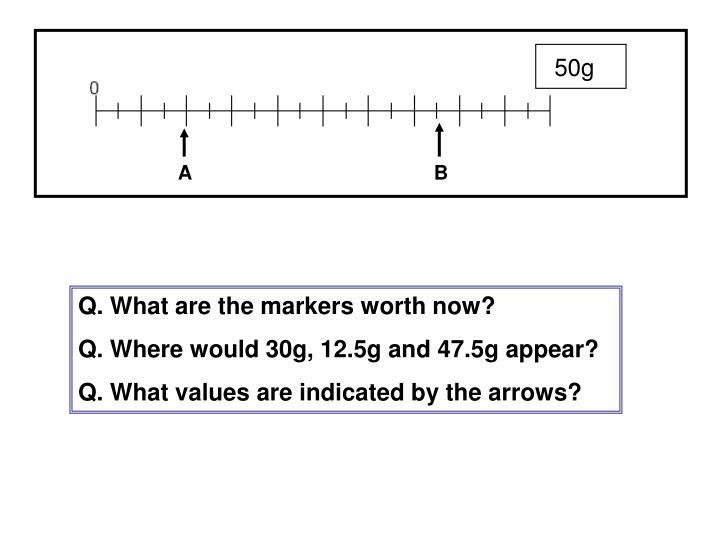 Where would 60 g appear? Q. 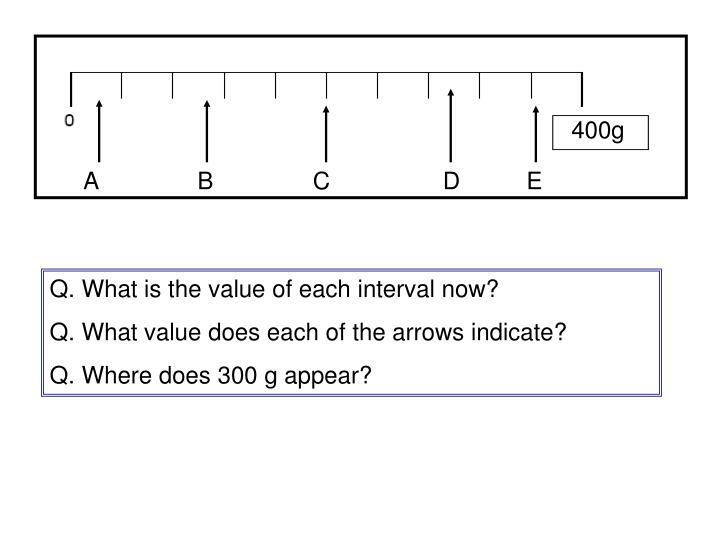 Where would 130 g appear? Q. 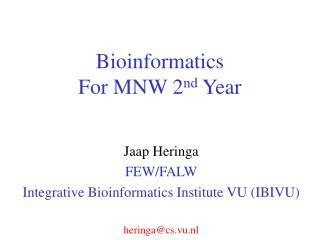 What is the value of each interval now? Q. Where does 300 g appear? Q. 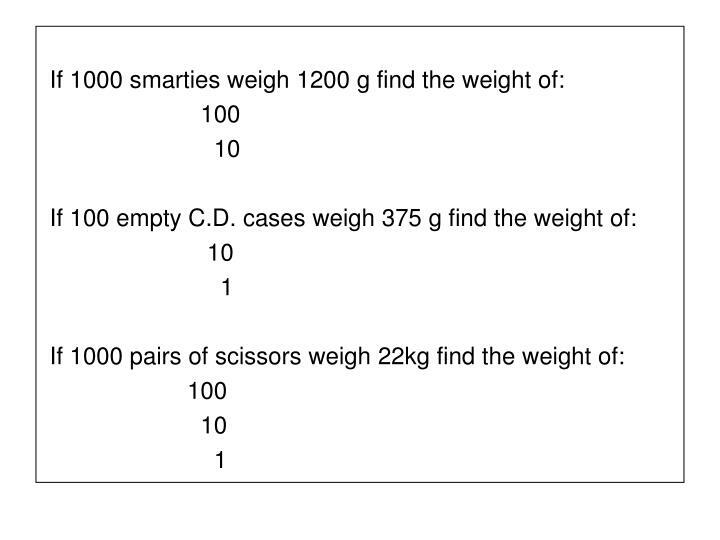 Where does 500 g appear? Q. Where have you seen a scale like this? Q. 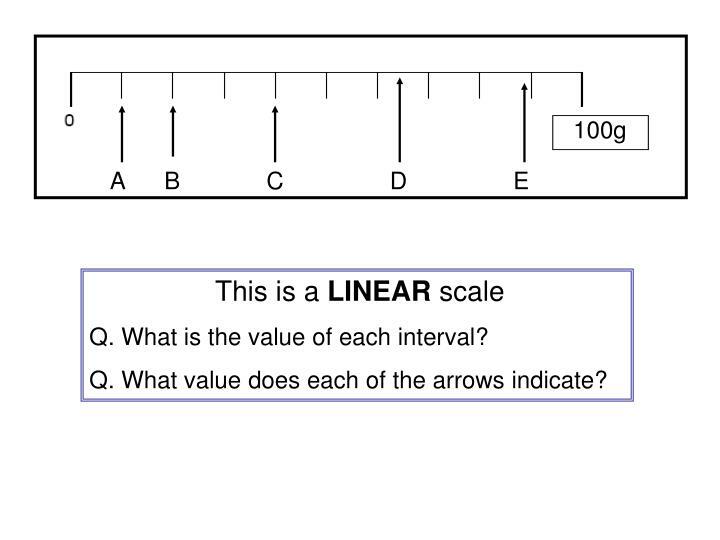 What is the difference between this scale and the last one? Q. 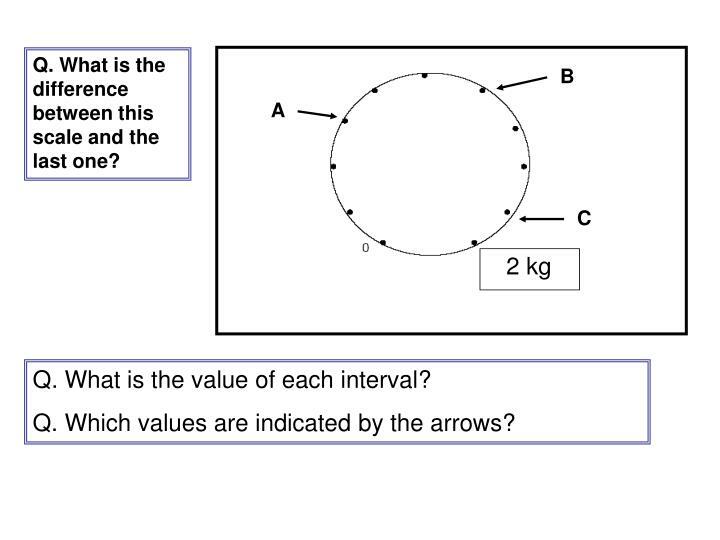 Which values are indicated by the arrows? 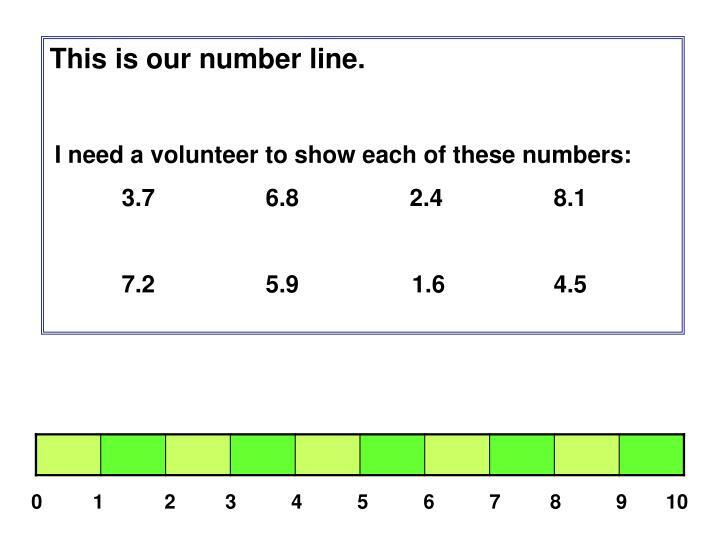 This scale is much finer than the first linear one we looked at. Q. What is the value of each large and each small marker. Q. 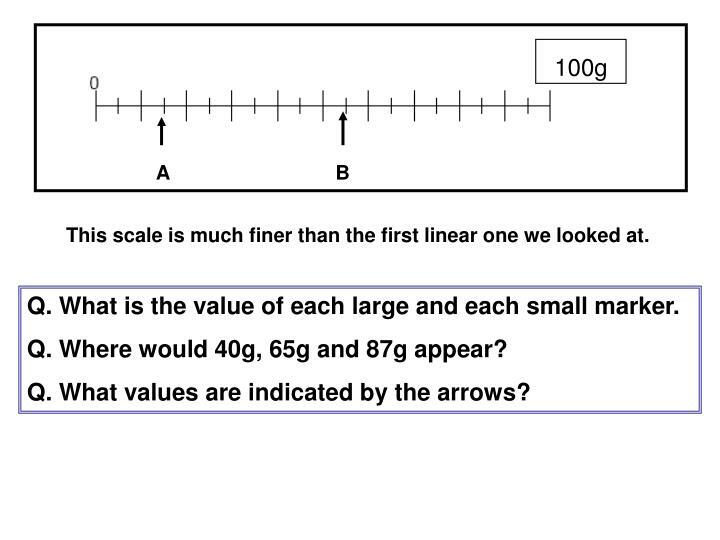 Where would 40g, 65g and 87g appear? Q. 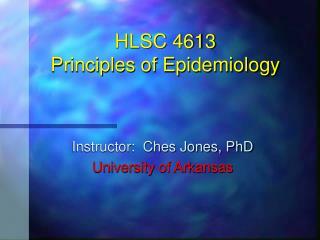 What values are indicated by the arrows? Q. What are the markers worth now? Q. 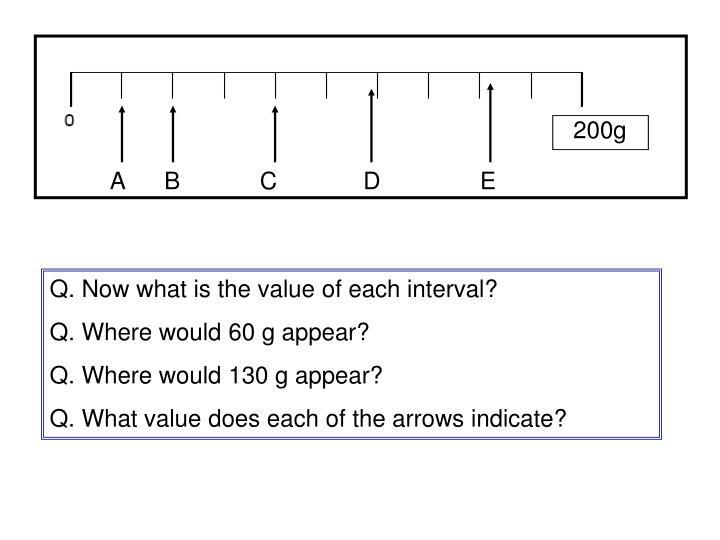 Where would 30g, 12.5g and 47.5g appear? 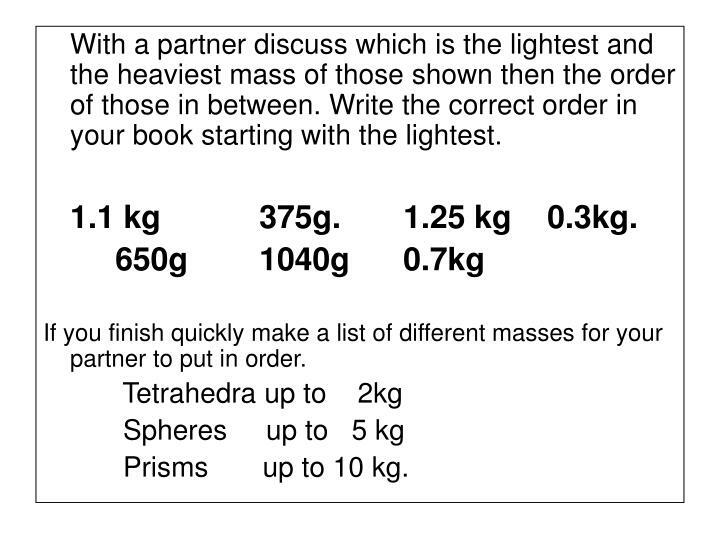 With a partner discuss which is the lightest and the heaviest mass of those shown then the order of those in between. 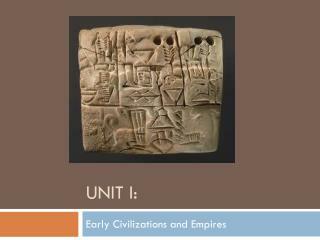 Write the correct order in your book starting with the lightest. 1.1 kg	375g. 1.25 kg	0.3kg. 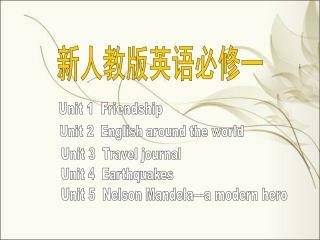 If you finish quickly make a list of different masses for your partner to put in order. Prisms up to 10 kg. 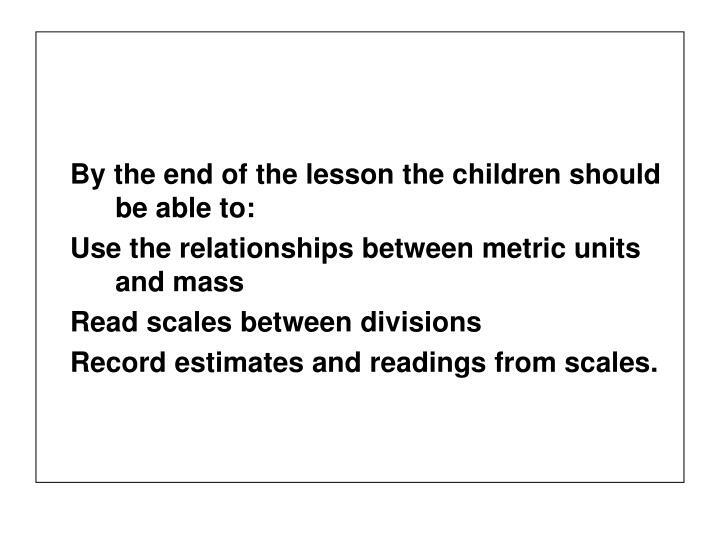 Record estimates and readings from scales. 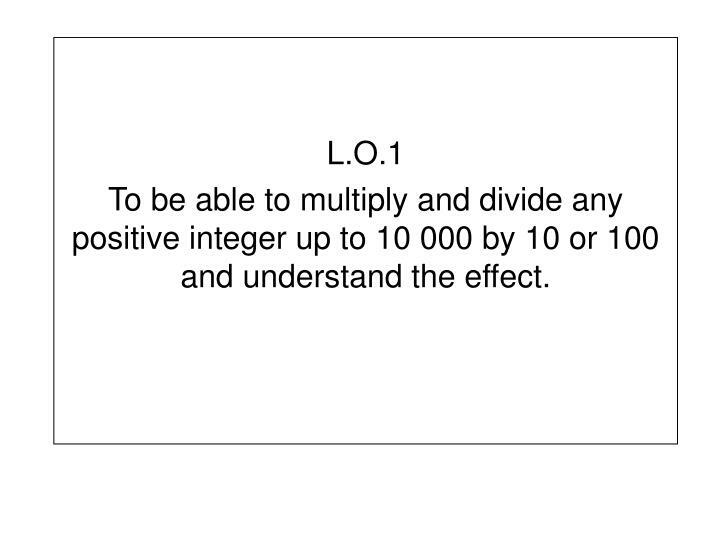 To be able to multiply and divide any positive integer up to 10 000 by 10 or 100 and understand the effect. Q. 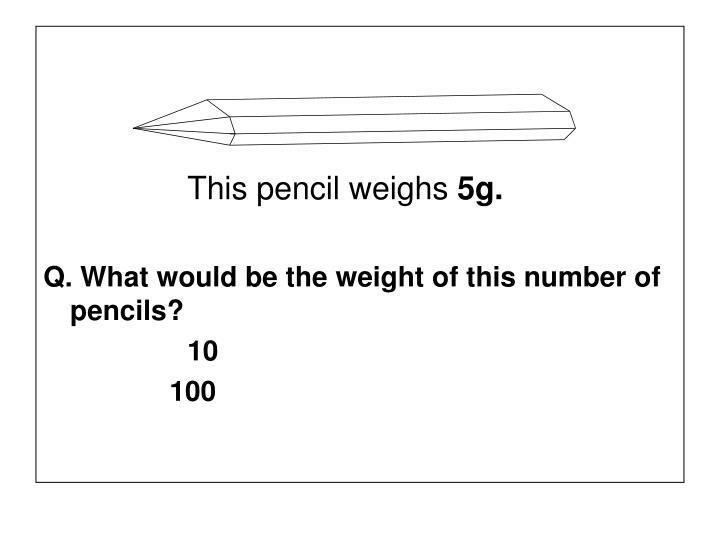 What would be the weight of this number of pencils? 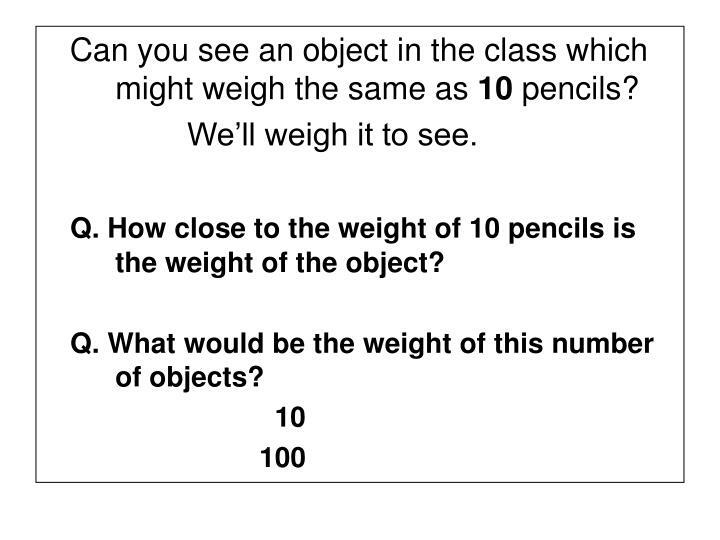 Can you see an object in the class which might weigh the same as 10 pencils? We’ll weigh it to see. Q. How close to the weight of 10 pencils is the weight of the object? Q. 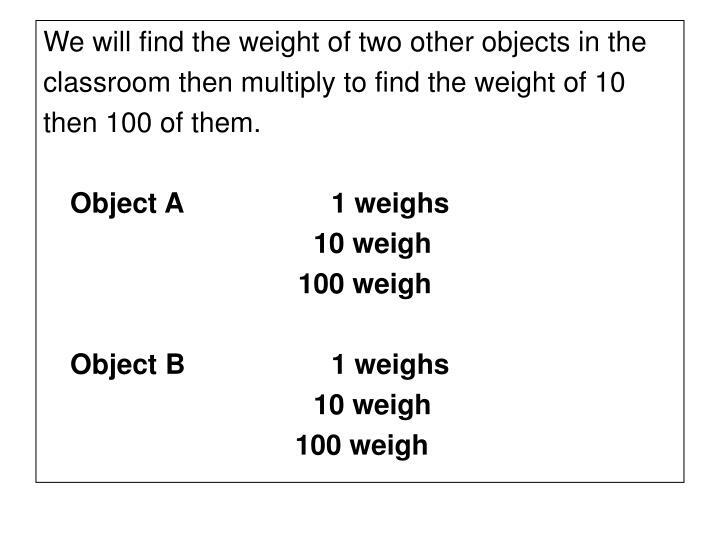 What would be the weight of this number of objects? 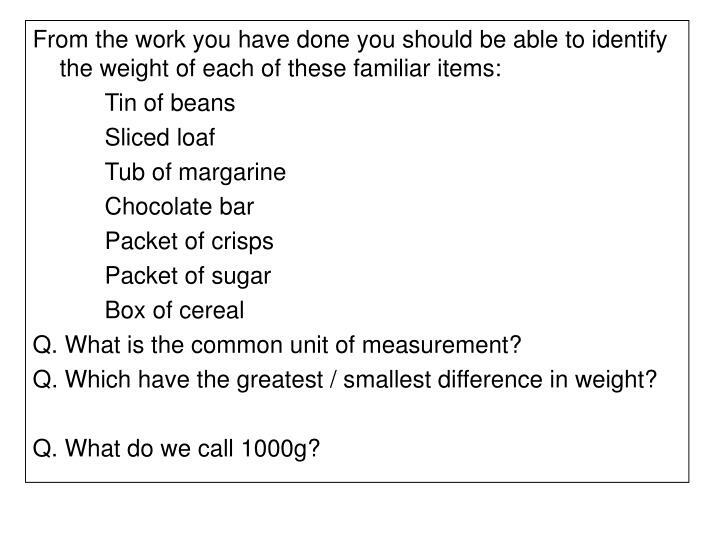 Can you see an item in the class which might weigh the same as 10 of these objects? Q. 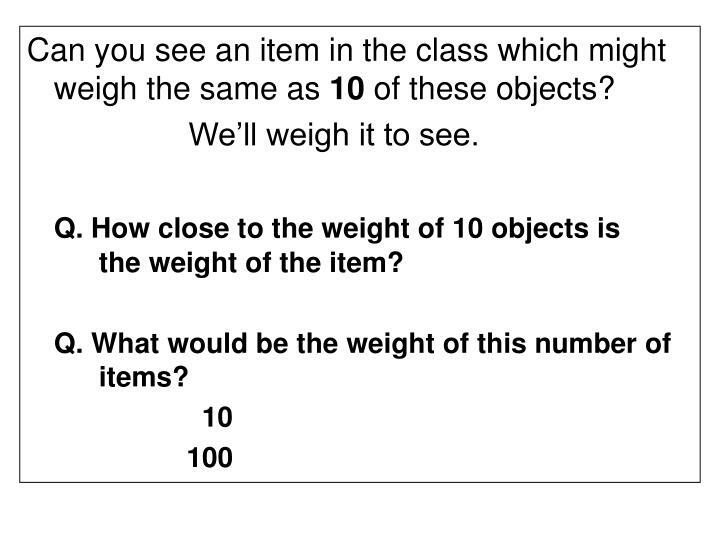 How close to the weight of 10 objects is the weight of the item? Q. 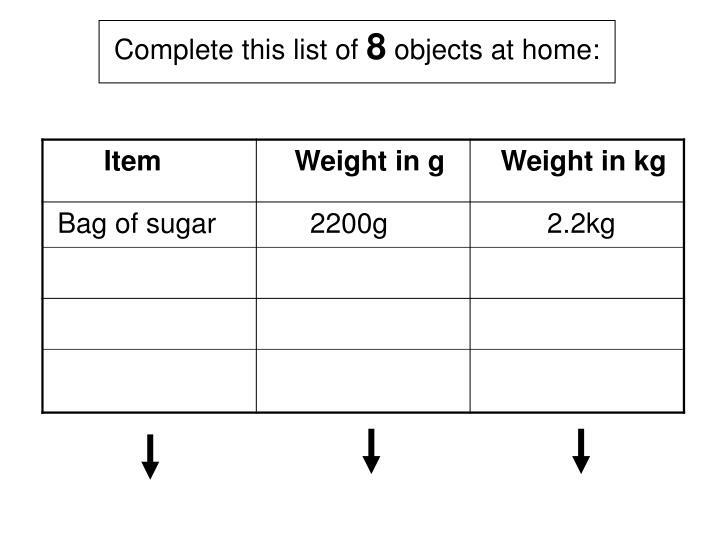 What would be the weight of this number of items? Q. 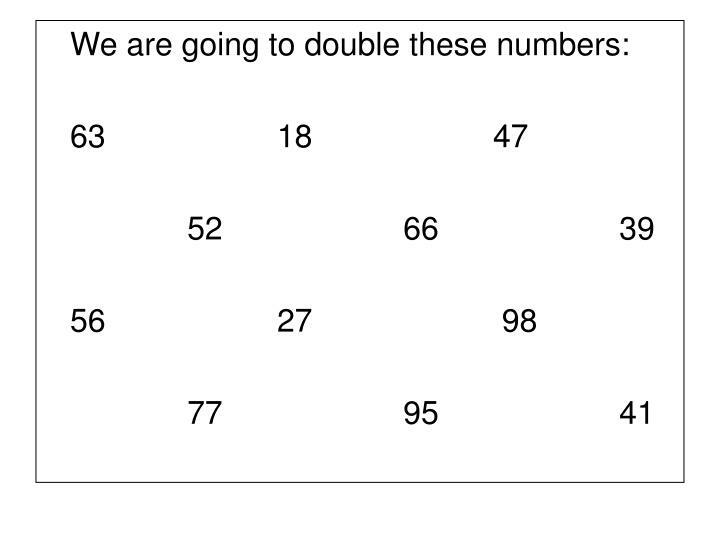 What is the effect of multiplying a number by 10 or by 100 on the position of the digits? Q. 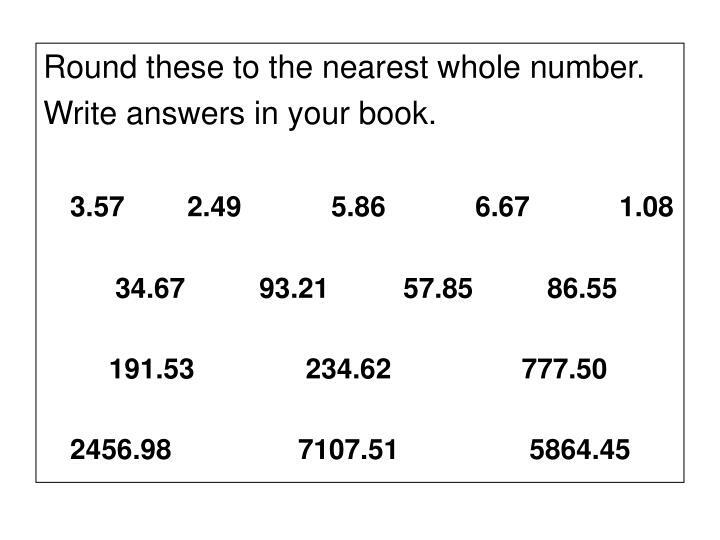 What is likely to be the effect on the digits of dividing a number by 10 or 100? Q. 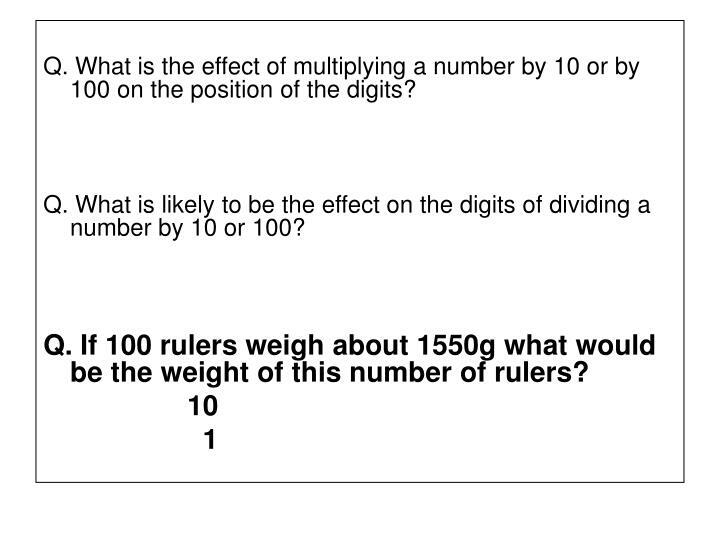 If 100 rulers weigh about 1550g what would be the weight of this number of rulers? 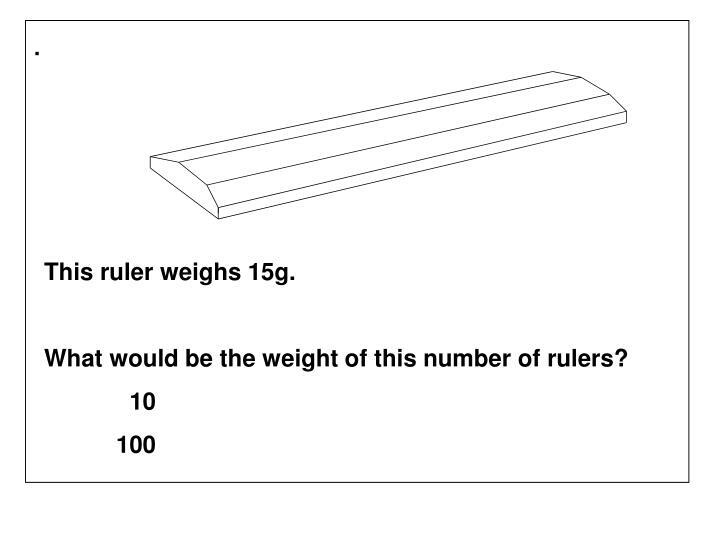 What would be the weight of this number of rulers? 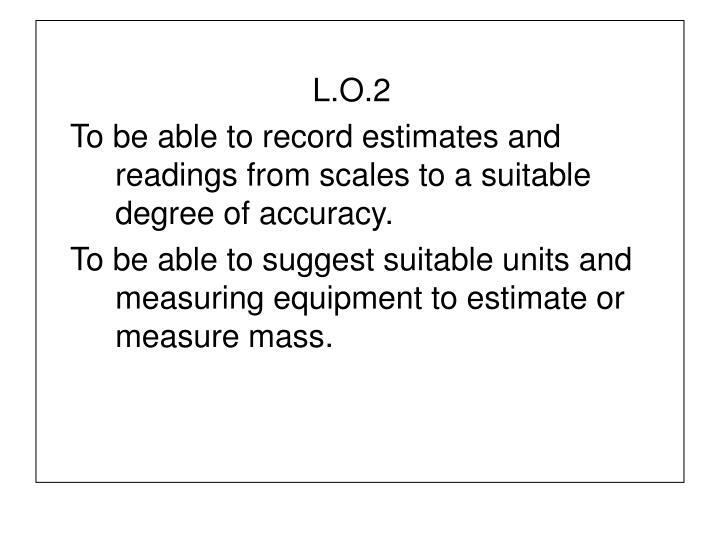 To be able to suggest suitable units and measuring equipment to estimate or measure mass. Q. 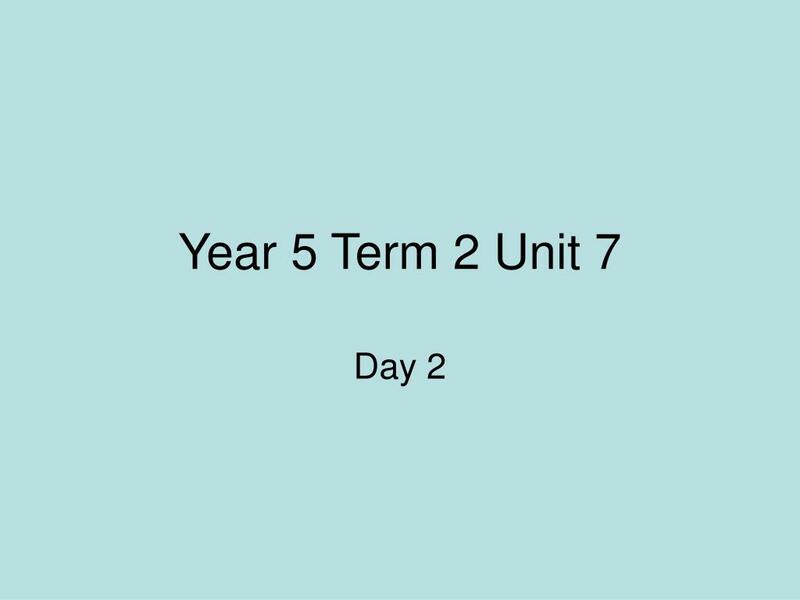 What is the common unit of measurement? Q. Which have the greatest / smallest difference in weight? Q. What do we call 1000g? 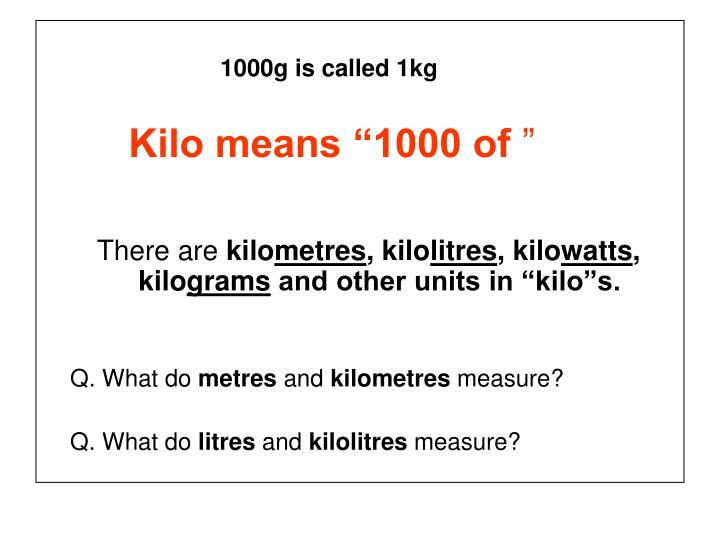 There are kilometres, kilolitres, kilowatts, kilograms and other units in “kilo”s. Q. 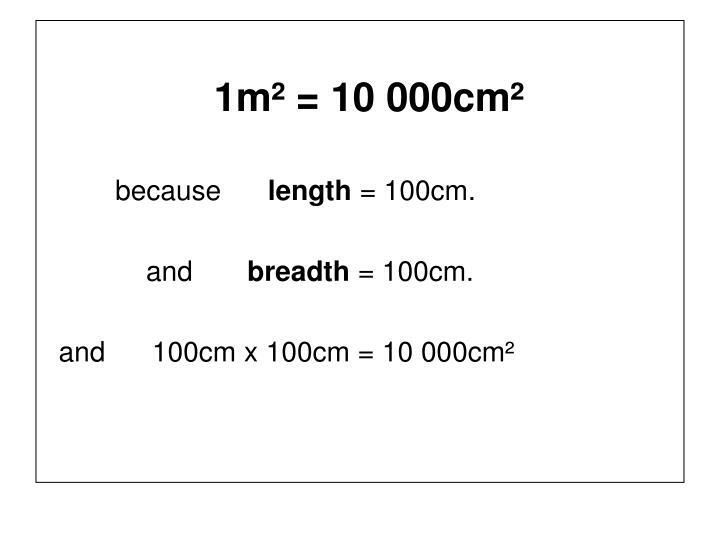 What do metres and kilometres measure? Q. 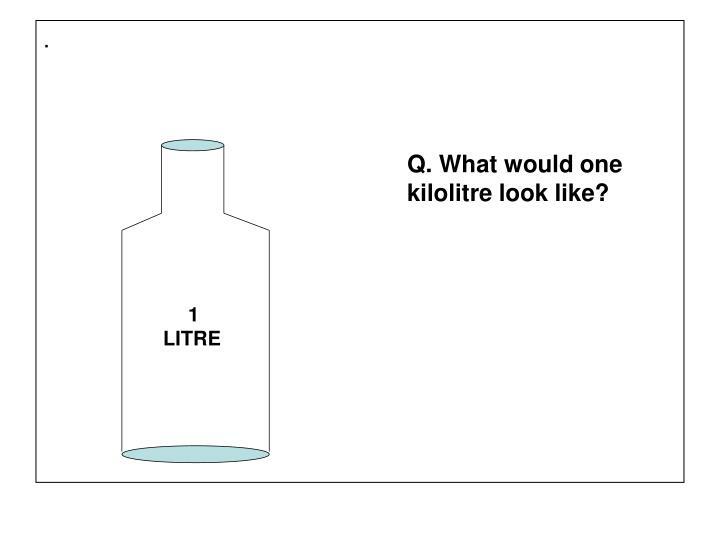 What do litres and kilolitres measure? 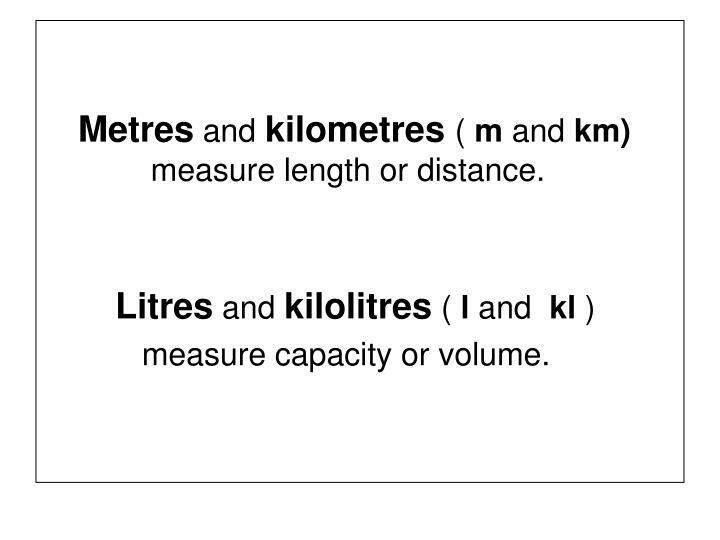 Metres and kilometres( m and km) measure length or distance. 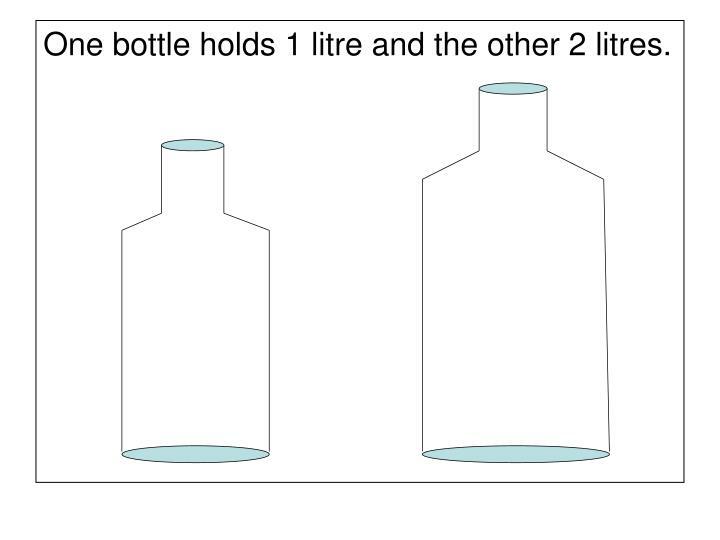 One bottle holds 1 litre and the other 2 litres. Q. 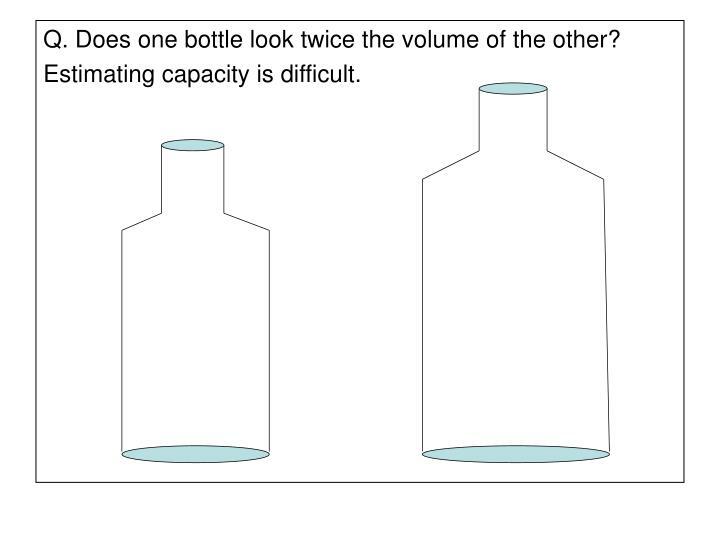 Does one bottle look twice the volume of the other? Q. What would one kilolitre look like? Q. 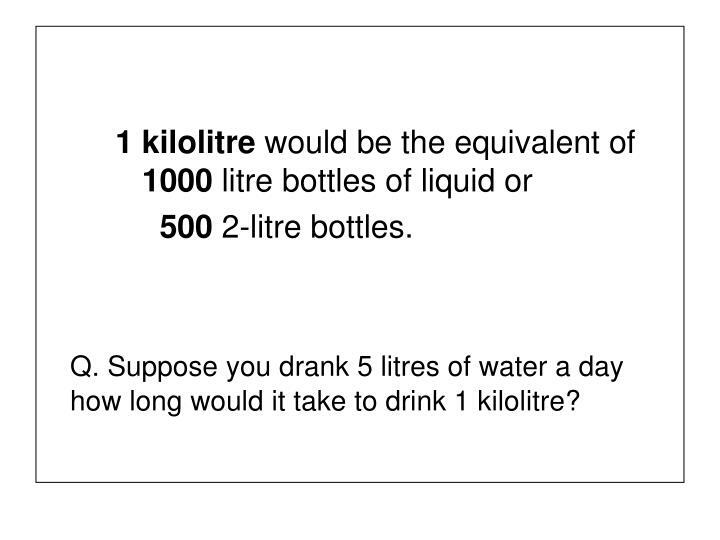 Suppose you drank 5 litres of water a day how long would it take to drink 1 kilolitre? 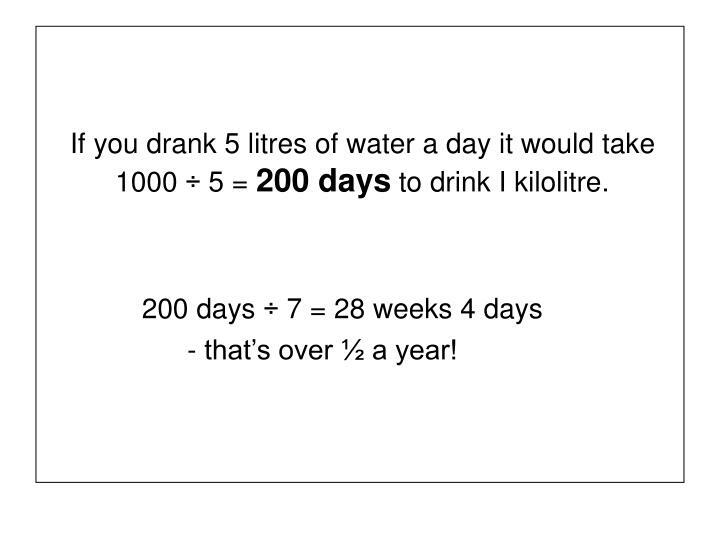 If you drank 5 litres of water a day it would take 1000 ÷ 5 = 200 days to drink I kilolitre. - that’s over ½ a year! 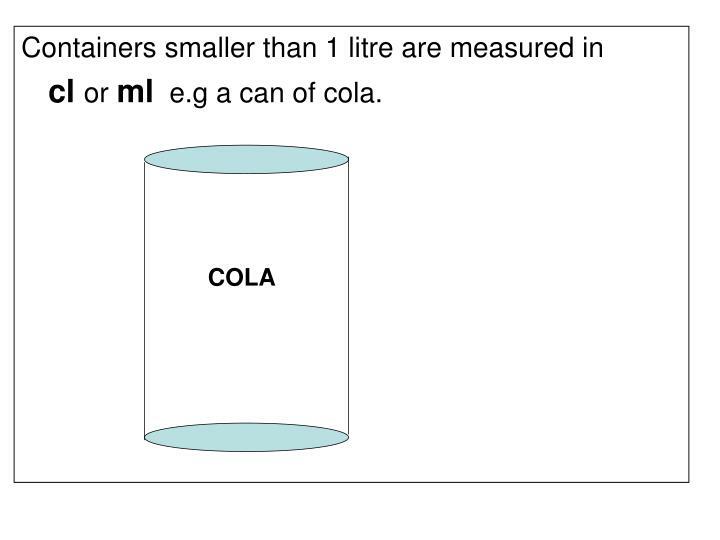 cl or ml e.g a can of cola. Q. 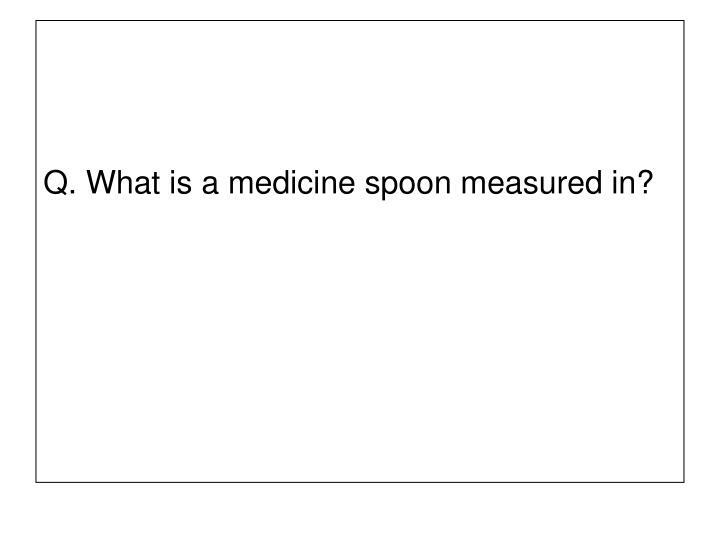 What is a medicine spoon measured in? 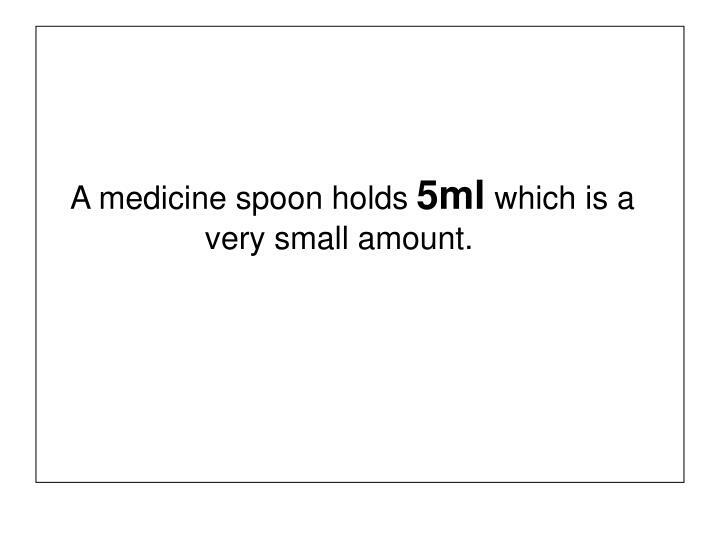 A medicine spoon holds 5ml which is a very small amount. 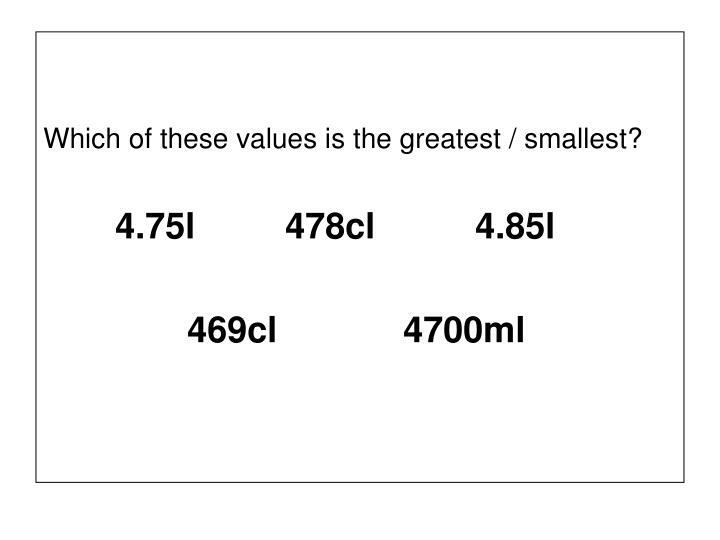 Which of these values is the greatest / smallest? 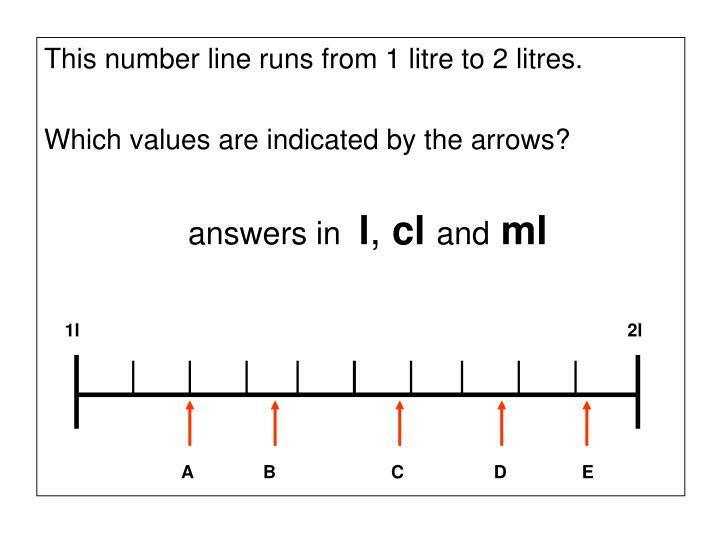 This number line runs from 1 litre to 2 litres. 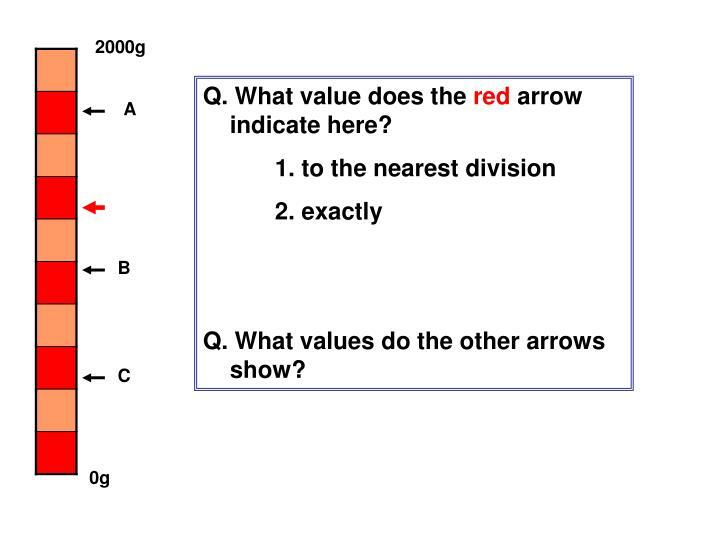 Which values are indicated by the arrows? 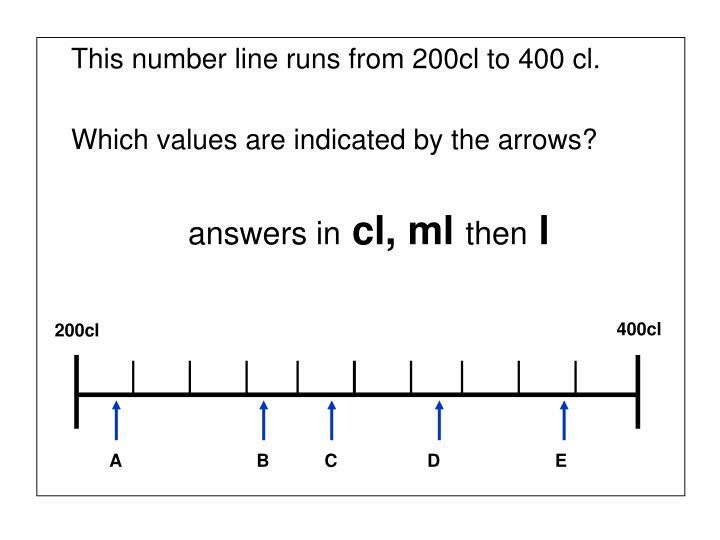 This number line runs from 200cl to 400 cl. 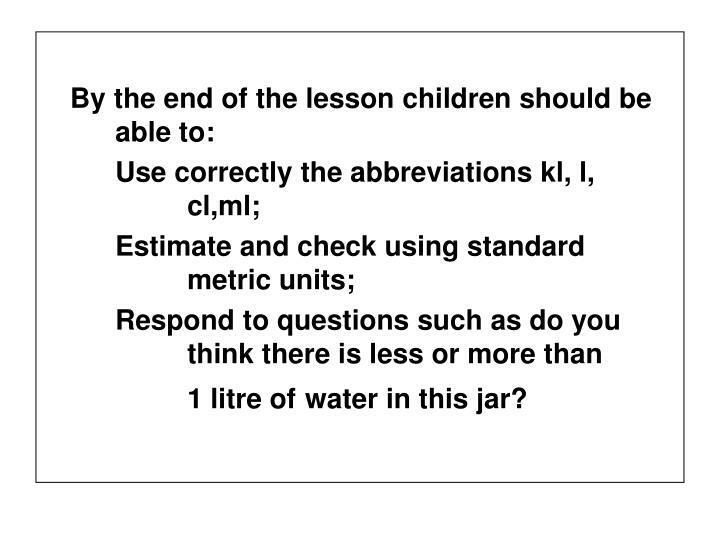 1 litre ofwater in this jar?